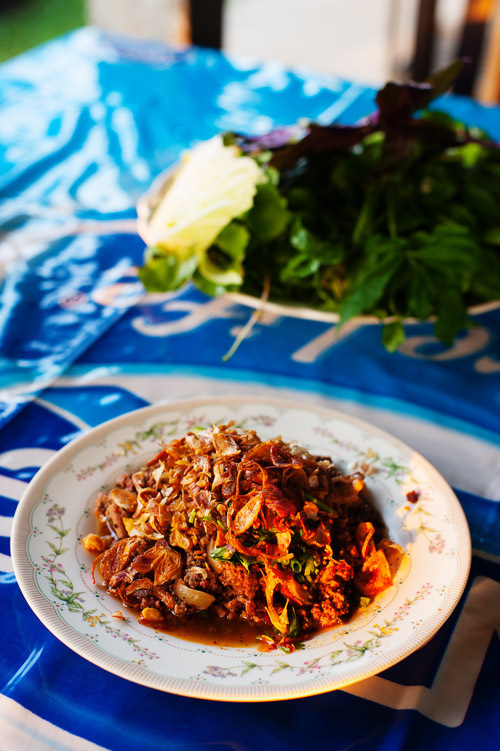 As mentioned previously, khao sen (ข้าวเส้น), a thin, pork- and tomato-based broth served over khanom jeen noodles, is one of the most popular dishes in Mae Hong Son. It's also a relatively easy dish to re-create if you live somewhere where you don't have access to exotic ingredients. If you can't get fresh khanom jeen noodles where you live, try rehydrating sen mee -- the thinnest grade of Thai-style dried rice noodle (shown here). 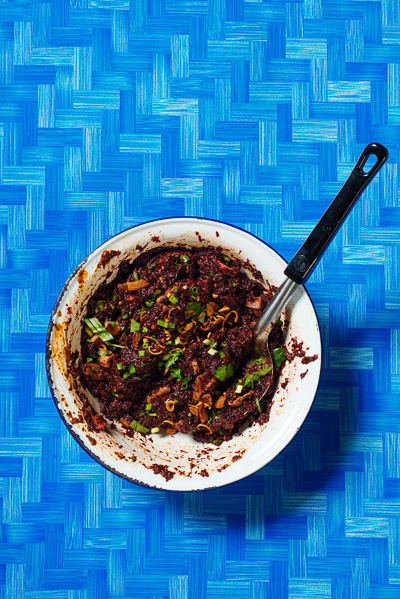 This recipe was told me by the second generation cook at Paa Jaang, a home-based restaurant that serves the dish. 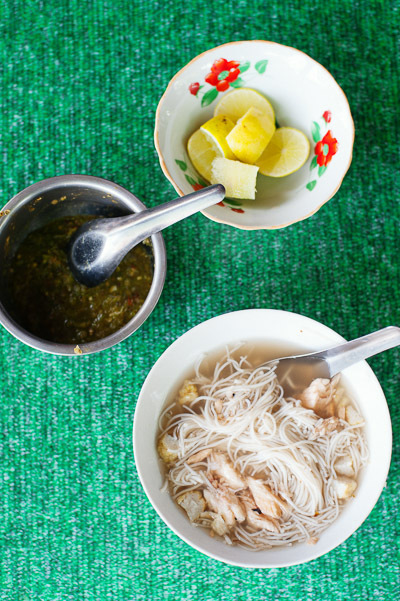 In Mae Hong Son, khao sen is eaten for breakfast or as an afternoon snack. Heat oil in stock pot over a low flame and fry shallots and garlic until fragrant, about 5 minutes. Add shrimp paste, mixing and pressing to combine, until fragrant, about 2 minutes. Add canned mackerel (including tomato sauce), mixing and pressing to combine, until fragrant and a thin layer of oil emerges, about 5 minutes. Increase heat to medium and add tomatoes. Fry until somewhat reduced and oil re-emerges, about 20 minutes. Add pork. Fry until oil re-emerges, 10 minutes. Add water and pork bones. Increase heat to high; when mixture reaches a simmer, reduce heat to low and allow to simmer 20 minutes. Add Knorr chicken stock powder and salt to taste, if necessary. Allow to simmer another 10 to 20 minutes until soup is slightly reduced and amalgamated. The finished soup should still be relatively thin, and should taste tart, savoury and salty (in that order). Remove stock bones if they are too big to serve. 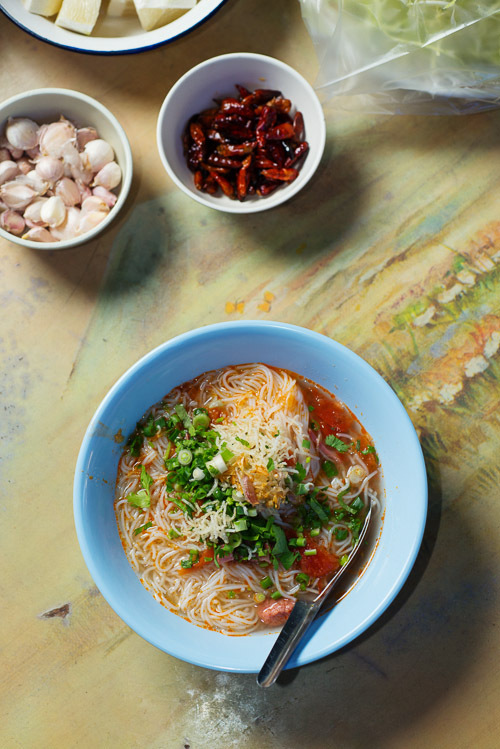 Serve a generous amount of the soup over khanom jeen noodles topped with garnishes of garlic oil, coriander and green onion, along with optional sides of shredded cabbage, lime, salt and dried ground chili. 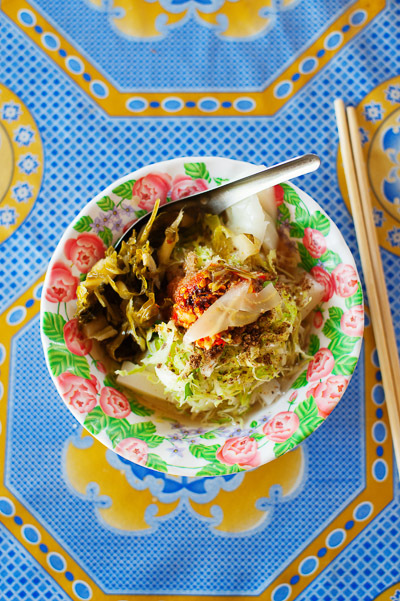 Mae Hong Son, a tiny town seemingly forgotten in Thailand's northwesternmost corner, doesn't have a reputation as a culinary destination. And honestly, most visitors would be disappointed by the town's more apparent restaurant options. But if pointed in the right direction, there's some quite interesting stuff to eat there. I've been writing about the food in this town for a while now, yet quite a few of the restaurants and vendors I've mentioned in previous years have shut down or gone down in quality. So I thought it high time to do an updated summary of the city's better places to get local food. Although most people in Mae Hong Son are Shan/Thai Yai, there's a handful of places to get northern Thai-style food. My personal fave is Lung Roen. 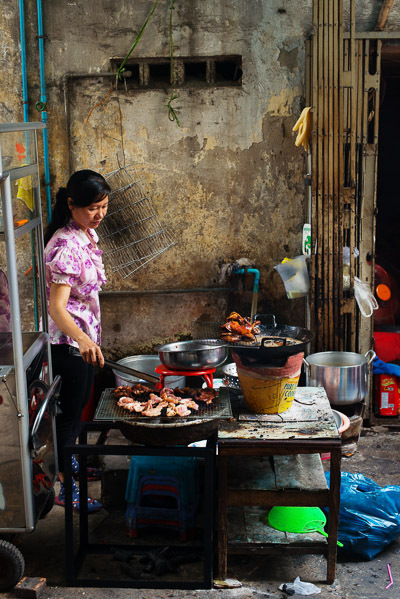 It's little more than wall-less, street-side shack, but the older family here do good laap and sides, in particular a really excellent -- rich, fatty, eggy -- aep (grilled banana leaf packets of meat and herbs) and a tasty tam som oh, a "salad" of pounded pomelo. and great sides -- the bamboo salad shown above was crunchy, spicy and savoury. Another decent option for northern Thai is Laap Chiang Mai. 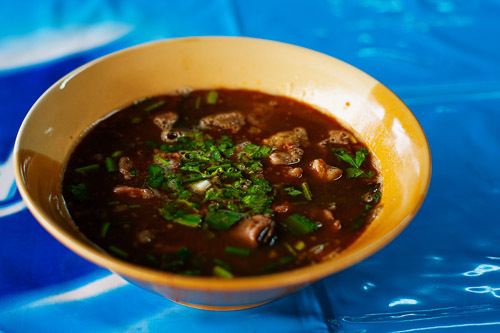 The laap here tends to be heavy on the blood and light on the spice, but the various soups and sides, in particular the nam phrik taa daeng (a northern Thai-style "dip" of dried chili and fish), are pretty good. It's also just about the only place in town to get relatively good local food come evening. For khao soi, the northern Thai curry noodle soup, by far the best bowl is town is at Chom Mai Restaurant. The chicken version here is rich and spicy, with, unusually, a hint of tomato. 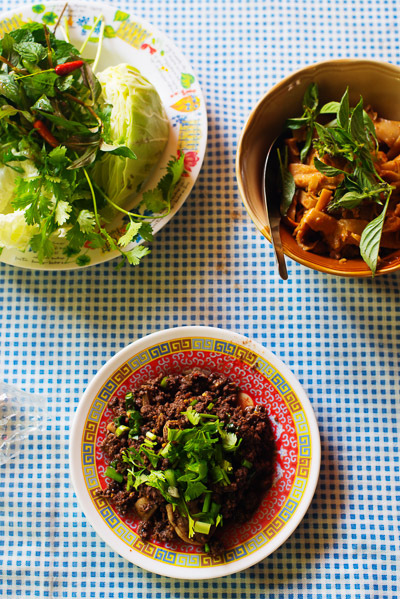 They also serve a few OK Shan-style dishes. And it's not an acknowledged part of the northern Thai genre, but kai op faang, chicken "roasted" in rice hay is available -- and delicious -- at Chaay Thung, about 13km outside of town. 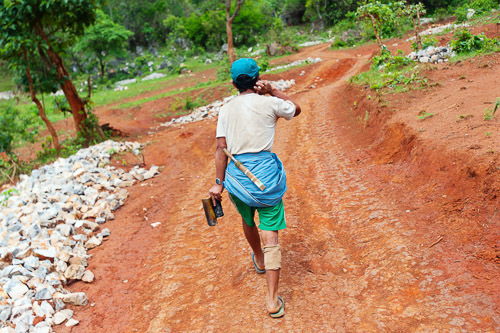 The Shan (also known as Thai Yai or simply Tai) are an ethnic group related to the Thai, but who predominately live across the border in Myanmar. 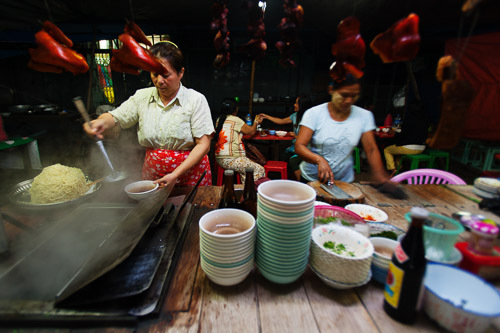 Much of their food has been influenced by Burmese-style cooking, and Mae Hong Son is the best place (in many cases, the only place) in Thailand to try these unique dishes. 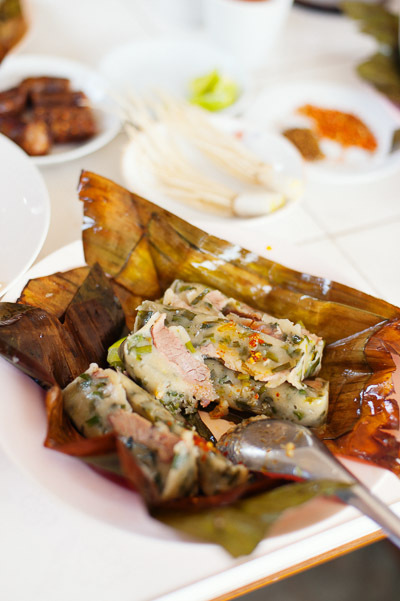 and Paa Jaang does excellent khao kan jin -- both raw and steamed (pictured at the top of this post). has an awesome balance of salty, sweet and sour that reminds me of American-style barbecue sauce -- if American barbecue sauce tasted about 100x better. 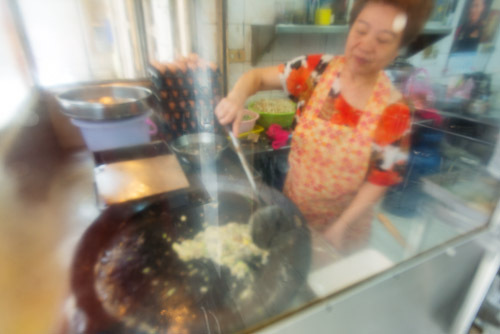 The dishes available change on a day-to-day basis, but she usually always has jin lung, the Shan-style herbal meatballs, and oop kai, a Shan-style chicken curry. can be got at Paa Nii. I recently took chefs Andy Ricker and David Thompson here, and the latter was so taken with the dish that he took a kilogram of the pickled greens back to Bangkok! 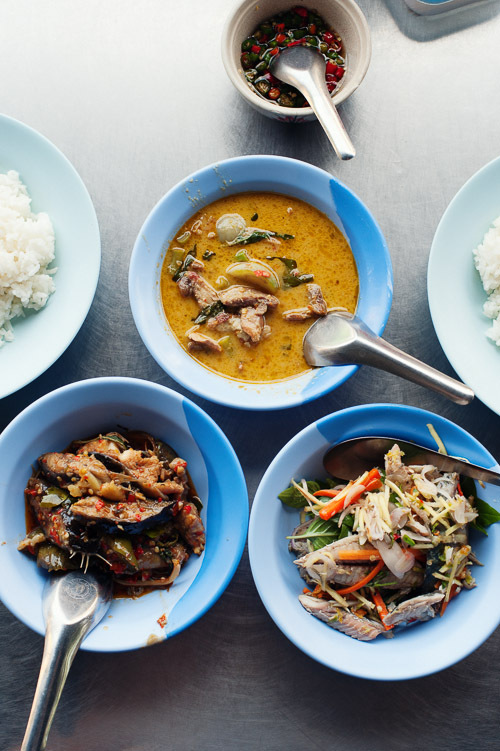 There's a widespread perception that Thai food is spicy. And justifiably so. 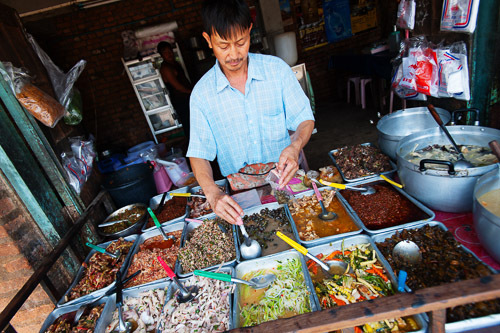 Thai people -- women in particular -- seem to relish in eating devastatingly hot dishes, and even have a repertoire of only marginally translatable words to express the equal parts painful and pleasurable sensation of doing so (example: เผ็ดจนหูอื้อ, phet jon huu eu, roughly "so spicy your ears ring"). But it's certainly not the case that everything in Thailand is spicy. 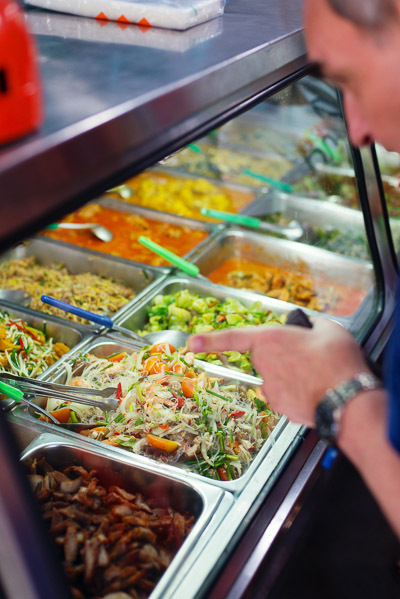 In fact, many of the dishes sold on the streets or from the shophouses of Bangkok -- particularly those of Chinese origin -- tend to be quite mild, sometimes bordering on bland. One of the more famous examples of this is satay. 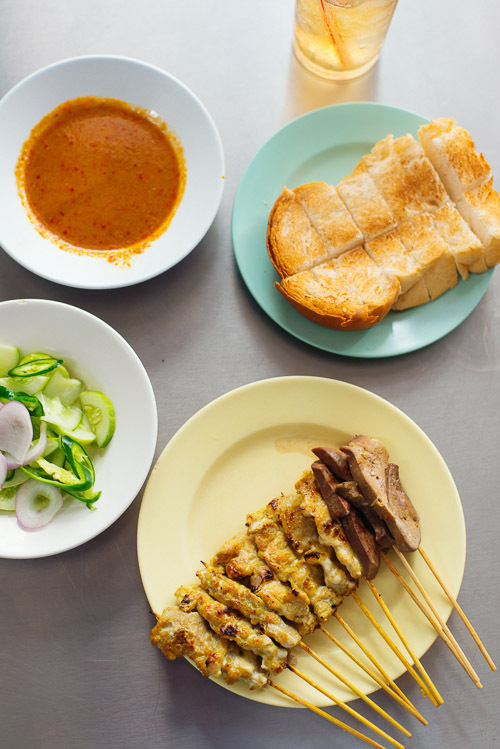 Although the dish is most likely Indonesian in origin and appears to have been brought to Thailand by Chinese immigrants, in the US, the peanut-based dipping sauce that accompanies the skewers of meat has somehow become synonymous with Thai food. Origins aside, in Thailand at least, I'd never cared for the stuff. 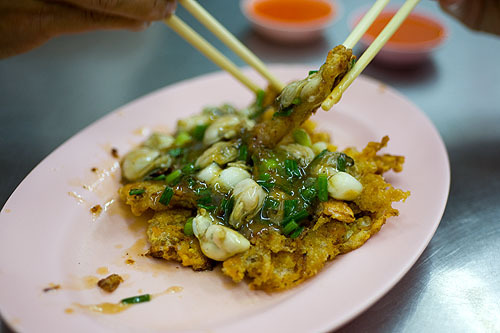 Most versions are dry and relatively flavourless, and come served with an cloyingly sweet dipping sauce -- a far cry from the delicate, fatty, spicy skewers and rich sauce one encounters in the dish's country of origin or even in Malaysia. But a recent discovery single-handedly changed my opinion about Thai-style satay. 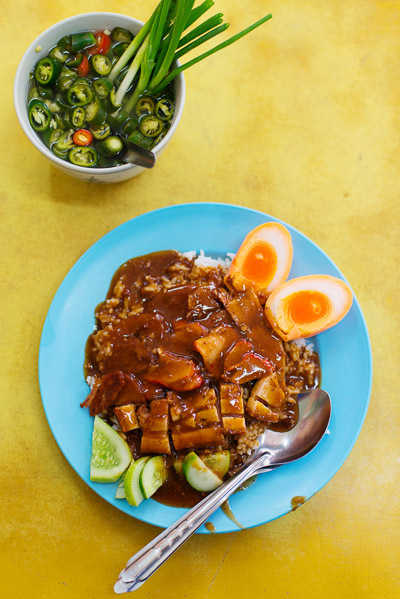 Chong Kee, a longstanding shophouse restaurant at the edge of Bangkok's Chinatown, specialises in the dish -- in fact, it's the only dish they serve. Like elsewhere, the skewers have been marinated in a mixture of coconut milk, turmeric and dried spice. Unlike elsewhere, the skewers at Chong Kee are smoky and surprisingly tender. 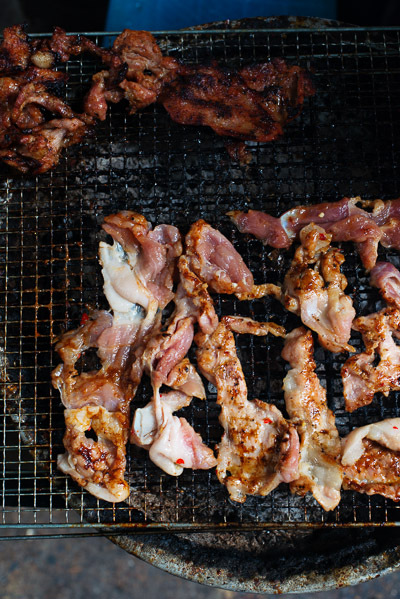 They use fattier cuts of pork (the staple meat for this dish in Thailand), which don't dry as quickly, and are great at soaking up all that flavourful smoke (they also serve a somewhat unusual liver version). 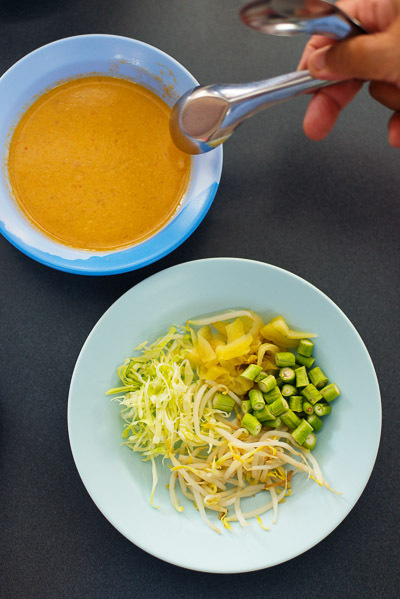 The accompanying peanut sauce is sweet, as it should be, but not overwhelmingly so, and also packs a tiny bit of chili spice and a pleasantly fragrant hint of coriander seed. Other sides include ajaat, sliced shallots, chili and cucumber in sweet/tart dressing, and thick slices of fluffy white toast. Next door, another longstanding restaurant sells an equally mild but delicious dish: khao muu daeng, rice topped with roast pork. Soft-boiled eggs (made orange by the addition of food colouring) and a condiment of mild chilis in vinegar are optional sides. The pork belly is great -- rich, crispy, fatty -- and the kun chiang (Chinese sausage) also good, but the roast pork is pretty mediocre -- more red food colouring than flavour. Regardless, the whole thing comes together in a favourably mild way that will trick you into wanting a second dish. and pork stomach with Chinese-style pickled vegetables are available intermittently. Two solid options for spice-fearing and adventurous eaters alike. you're probably in for a good meal. Khun Yah Cuisine, a restaurant in Bangkok's Chinatown, has both of these going for it. Perhaps more importantly, it also came highly recommended by veteran Thai food writer Suthon Sukphisit. But somehow it avoided the radar of me or longtime Thailand resident and food writer, Ung-Aang Talay, and a few months back the two of us ate there for the first time. 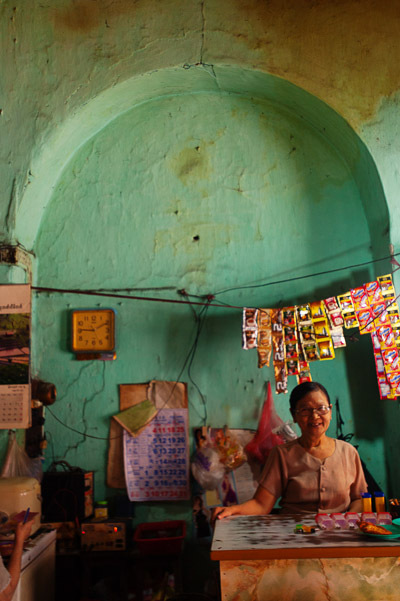 The eponymous Khun Yah is the current owner's grandmother (yah), herself allegedly a talented home cook originally from Nakhon Chaisri. It's been nearly 60 years since she first opened it, a fact evidenced its rather archaic opening hours (to avoid the disappointment of all the best dishes being sold out, be prepared to eat lunch at 10.30am), the previously-mentioned lack of decor, classic old-school, central Thai curry shop dishes, and drinking water served with essence of nam yaa uthaithip, an old herbal medicine. 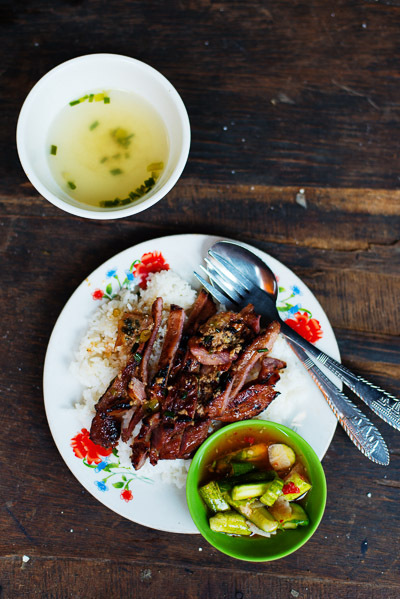 Yet it's not only about nostalgia; the food at Khun Yah Cuisine is exceptional. But I dare say that it's not the type of place that will blow most diners away. In fact, newbies to Thai food expecting fire and fish sauce will likely be disappointed. The dishes here are exercises in restraint and balance, featuring nuanced and subtle flavours that evoke what food used to be like generations ago; indeed, many reminded Ung-Aang Talay of the dishes he ate in the early '70s; (his Bangkok Post article about Khun Yah Cuisine can be seen here). We were told that, before it's added to the curry, the beef is simmered in coconut milk until tender -- a huge difference from the tough, grisly knots of beef one normally encounters in this dish. The resulting coconuty broth is then combined with coconut cream (fresh, not UHT) and curry paste (homemade, of course), lending the final dish an additional layer of meatiness. It's also this broth that provides the dish its slightly watery -- some would say soupy -- consistency. Folks used to the creamy, sweet green curries that are the norm today might think something's off here, but according to Ung-Aang Talay, this is what green curry used to be -- and should be -- like. Pleasantly crunchy -- and remarkably un-oily -- and featuring a delightful intersection of salty, sweet and spicy flavours. Other dishes I've encountered here on subsequent visits include lon puu khem (หลนปูเค็ม), a creamy, herbal 'dip' with salted crab and ground pork; a rich, herbal and rather dry phanaeng kai (แพนงไก่); plaa thuu jian (ปลาทูเจี๋ยน), a rare dish of deep-fried mackerel topped with a savoury dressing of minced pork, slivers of ginger and salted soybeans; a tart salad of mackerel, Thai basil leaves and ginger; and nam phrik kapi (น้ําพริกกะปิ), a type of shrimp paste-based 'dip', which unusually here was given body by boiled and smashed eggplant. made with rich duck eggs, pork fat, and, well, because it was done in the past, a topping of crispy pork fat. an almost faultless union of creamy, herbal, salty, sweet textures and flavours. Khun Yah Cuisine is concealed in what is essentially the car park of Wat Traimit; look for the large English-language sign. In late 2007, I was pointed in the direction of a New York Times piece on the dining scene in my hometown of Portland, Oregon. Among the restaurants highlighted was a place called Pok Pok. 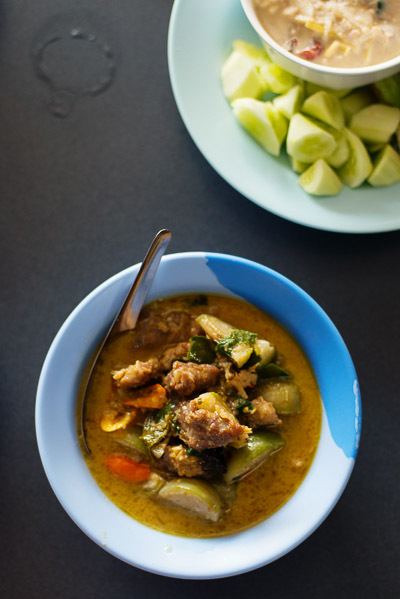 Unlike most restaurants in the US doing Thai food, Pok Pok wasn't serving green curry with bell peppers or phad Thai with beef, but rather, stuff that Thai people actually eat: yam khai dao, hearty soups, obscure chili-based 'dips' and other rustic, regional Thai dishes. My interest was piqued, and I shot off an email to the restaurant's chef/owner. He replied almost immediately, and to my surprise, was familiar with the very blog you're reading now. He was coming to Thailand in a few months, and we arranged meet up. Six years later, that guy and I are friends and collaborators. 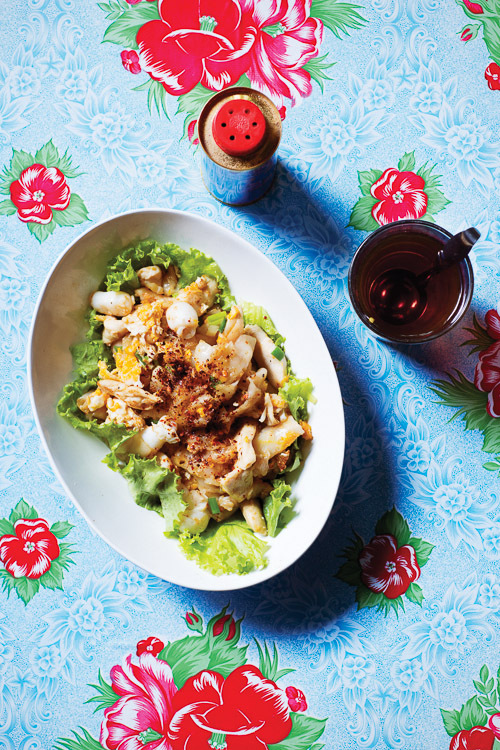 -Many of the recipes in Pok Pok can appear pretty time-consuming and/or involve obscure techniques and ingredients. At the same time it's quite readable and has an engaging narrative flow. Did you approach it as a functional cookbook that people will actually cook from, or more as a reference (or perhaps even entertainment)? Both; these days cookbooks need to be more than a volume of recipes, they also need to have a story and lots of pretty pictures to sell well. Having said that, it was really important to me that this be a working cookbook, something that you could get dirty. -For those familiar with Thai food, a glance at the list of recipes alone seems to indicate that Pok Pok doesn't pull any punches. In a general sense, what kind of allowances did you have to make for an American audience? Very few. Basically, we left out recipes that had ingredients that are hard or impossible to find in the West. 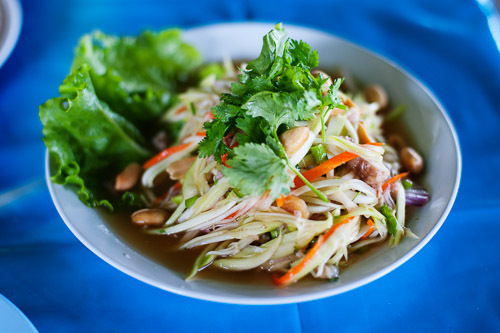 -Are these Thai recipes or your recipes? 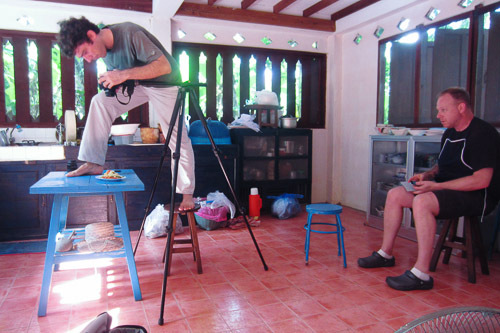 These are recipes I have learned over 20 years of traveling, eating and cooking in Thailand. Most are my attempt to make a version of the dish that would be acceptable to the folks who come from the region the dish originates in. 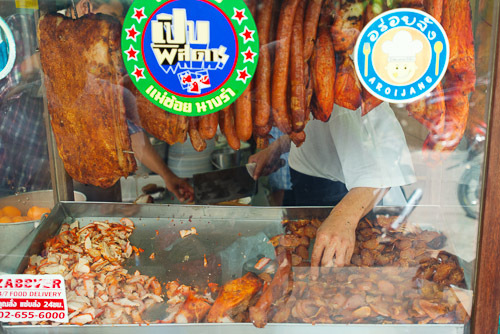 -Quite a few of the recipes have their origins in northern Thailand. What is it about this region's food that appeals to you so much? It's my first true love when it comes to the food of Thailand. There is just something about the flavor combinations and style of cooking that appeals to me more than any other region's. 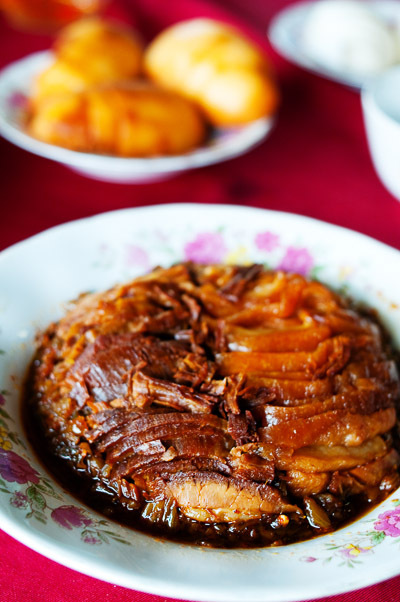 -You chose to profile the recipe for northern-style laap. 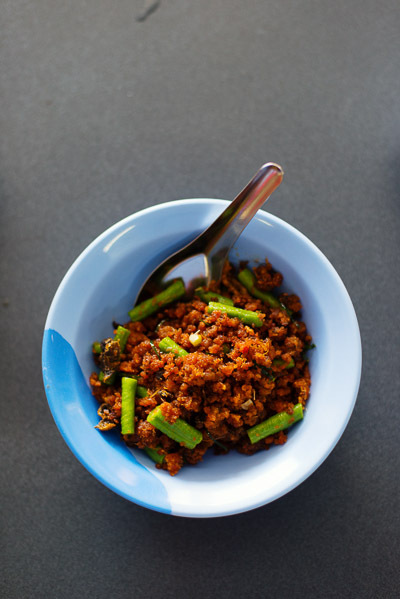 It's also one of my favourite Thai dishes, but at its core it's essentially just minced meat and spice. What is it that's so special about this dish? 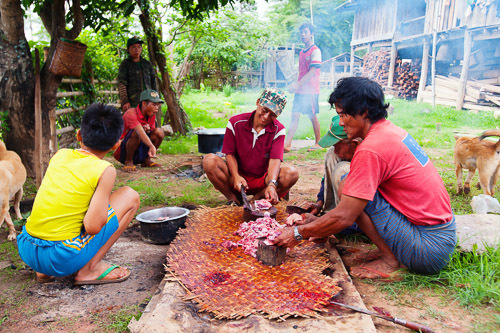 To me it is emblematic of the cuisine of northern Thailand. It is highly fetishized in the north, with variations in every province, city, town and even house to house. The way it is eaten, shared with lots of fresh herbs and vegetables along with sticky rice, often alongside beer or booze in a convivial atmosphere is at the core of of how Thai people eat: it's not just what you eat, it's how and (maybe most important) why you eat. -Any tips for people who want to make it? Have patience, try it more than once, and do not skip the fresh herbs and vegetables, nor the sticky rice; they are an essential part of the dish. Make the naam phrik laap (laap seasoning paste) Put the chiles in a small dry pan or wok, increase the heat to high to get the pan hot, then decrease the heat to low. Cook, stirring and flipping them frequently to make sure both sides of the chiles make contact with the hot pan, until the chiles are brittle and very dark brown (nearly black) all over, 15 to 20 minutes. Remove the chiles from the pan as they’re finished. (Discard any seeds that escape the chiles, because they’ll be burnt and bitter.) Set the chiles aside. Combine the makhwen, coriander seeds, fennel seeds, ground galangal, ground lemongrass, black peppercorns, cumin seeds, nutmeg, cloves, long peppers, star anise, mace, and cardamom in a small pan, set the pan over low heat, and cook, stirring and tossing often, until they’re very fragrant, about 5 minutes. Turn off the heat and stir for another minute. Grind them in a spice grinder (or pound them in a granite mortar) to a fairly fine powder. Combine the dried chiles and salt in a granite mortar and pound firmly, scraping the mortar and stirring the mixture once or twice, until you have a fairly fine powder, about 5 minutes. Add the garlic and pound, occasionally stopping to scrape down the sides of the mortar, until you have a fairly smooth paste, about 2 minutes. Do the same with the shallots. Next, add the ground spice mixture and pound until it’s well incorporated into the paste, about 2 minutes. Finally, pound in the shrimp paste until it’s fully incorporated, about 30 seconds. You’ll have about 1/2 cup of paste. You can use it right away, or store the paste in the fridge for up to 1 week or in the freezer for up to 6 months. It helps to freeze the paste in small portions. You’ll need about 6 tablespoons of paste for enough laap to serve 6 to 12 people. Cook the offal Combine the intestines, skin, liver, shrimp paste, galangal, lemongrass, and water in a small pot. Set the pot over high heat and bring the water to a strong simmer. Check the pork liver. Once it’s cooked through (firm and just barely pink in the center), transfer it to a cutting board. Decrease the heat to maintain a gentle but steady simmer, skimming off any surface scum. Keep cooking until the skin is translucent and soft enough to easily slice, about 20 minutes. 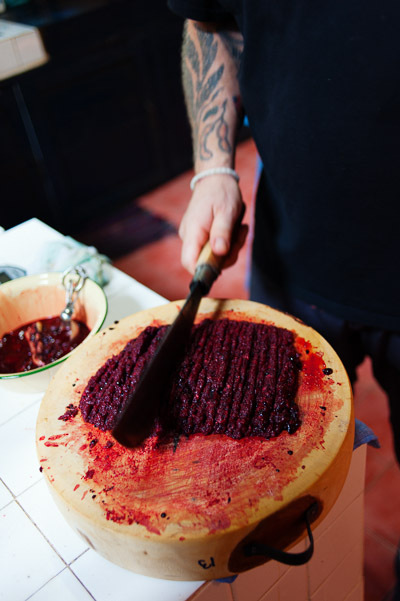 Transfer the intestines and skin to the cutting board with the liver and reserve 2 cups of the liquid. When they’re all cool enough to handle, slice the intestines and liver into small bite-size pieces. Slice the skin into thin 2-inch- long strips. Chop ("laap") the pork Clear your appointments for the next 45 minutes. Combine the lemongrass and blood in a mixing bowl and use your hand to squeeze and squish the lemongrass stalk for about a minute. You’re helping to release the essence of the lemongrass, which tones down the flavor of the blood and keeps the blood liquid. Leave the lemongrass in the blood for now, but avoid it when you spoon out the blood later. 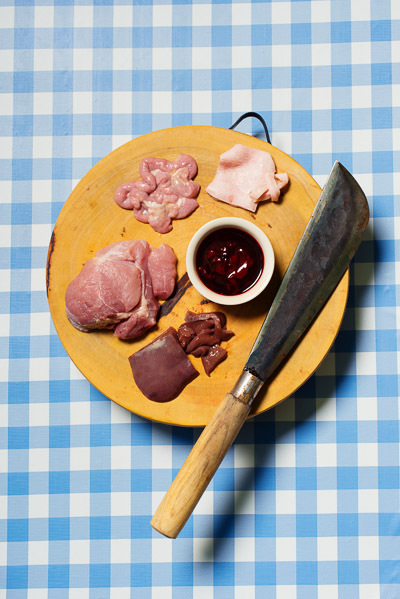 Put the pork slices on a solid wood chopping block or cutting board. 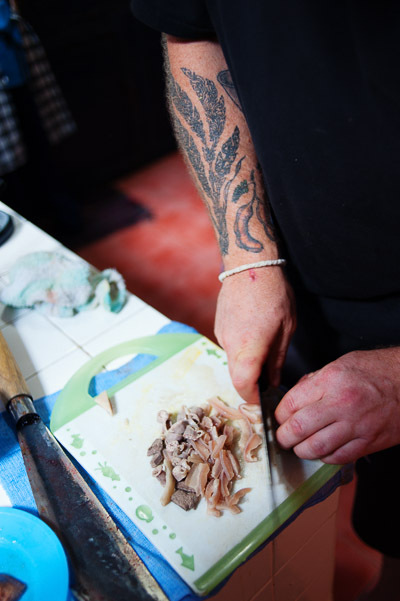 Use a heavy knife or cleaver to chop the pork, lifting the knife off the block with each chop and working methodically from one side of the expanse of meat to the other, then working your way back. (How hard should you chop? Pretend you want to hack a medium-size carrot into two pieces with each chop. Rely on your wrist for motion and the weight of the knife for most of your power.) Every 15 seconds or so, use the knife to scoop up some of the meat and fold it back onto the rest. Make sure you’re not neglecting any spots. 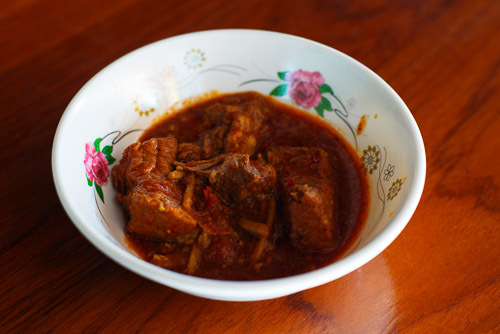 Once the meat is coarsely chopped, after about 5 minutes, drizzle on 2 tablespoons of the blood (leaving behind the lemongrass), and keep chopping and folding as before to incorporate the blood and to continue chopping the meat more and more finely. 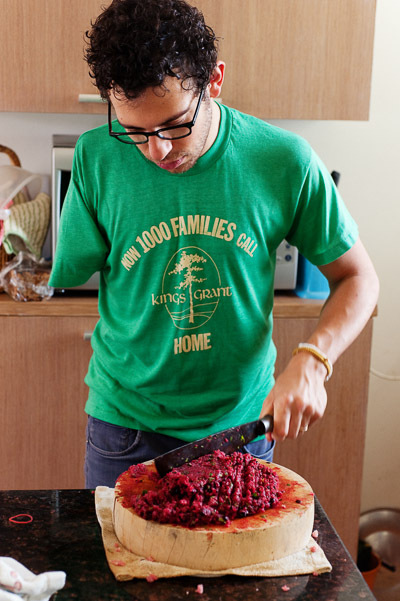 Keep at it, adding another 2 tablespoons of blood every 5 minutes but stopping once you’ve used a total of 1/2 cup, until the blood is completely incorporated (the meat will be a deep purple reminiscent of beets), and the meat is very finely minced (you’re shooting for a level several times finer than that of store-bought ground meat). After 15 minutes, you’ll have reached hamburger texture. Keep going. It requires about 30 to 40 minutes of chopping, depending on your facility for it. Discard the rest of the blood. (Don’t worry, blood isn’t expensive.) Transfer the minced meat mixture to a bowl. You’ve just spent more time and expended more energy than most people do preparing and eating an entire meal, so it should go without saying that you don’t want to leave any of your hard-won mince on either the chopping block or your knife. Do, however, discard any waxy fat that might have collected on your knife blade. Prepare the laap for cooking ("yam" the laap) In a medium mixing bowl, stir together the 1/2 cup of reserved offal cooking liquid with the 1/2 teaspoon of salt and 5 to 7 tablespoons of the laap seasoning paste, depending on how intensely flavored you want the final dish to be, until they’re well mixed. Add all of the raw meat mixture and cooked offal, then stir gently but well. Add the salt, green onions, and herbs, stir well, then add the fried shallots and garlic and stir well. 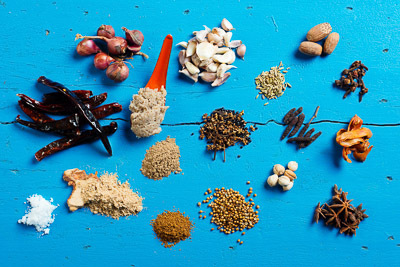 At this point, the average Northern Thai cook would taste the mixture and adjust the seasoning, adding salt (or less typically in the North, fish sauce) if it isn’t salty enough and more naam phrik laap if it is not spicy or intense enough. If you’re brave, go ahead. (If not, you can season it later, as it cooks.) Raw laap is delicious and rich. Northern Thai men of a certain generation would say it is superior to the cooked version. And I agree. Cook and serve the laap Heat a wok or large pan over high heat, add the oil, and swirl it in the wok to coat the sides. When the oil begins to smoke lightly, add the meat mixture, stir well, then add 11/2 cups of the reserved offal cooking liquid. Cook, stirring constantly and breaking up the meat to ensure that it doesn’t clump, until the meat is cooked, the liquid begins to simmer vigorously, and the mix- ture looks slightly soupy as the meat gives up its water, about 5 minutes. Taste and season with more salt or laap seasoning paste. Keep cooking at a vigorous simmer, stirring often, so the flavors have a chance to meld, about 3 minutes more. Spoon the laap onto a large plate or platter in a low mound. There should be some liquid pooling at the edges. Let it cool to just above room temperature, then sprinkle on the green onions, herbs, fried shallots and garlic, and pork cracklings, and serve. 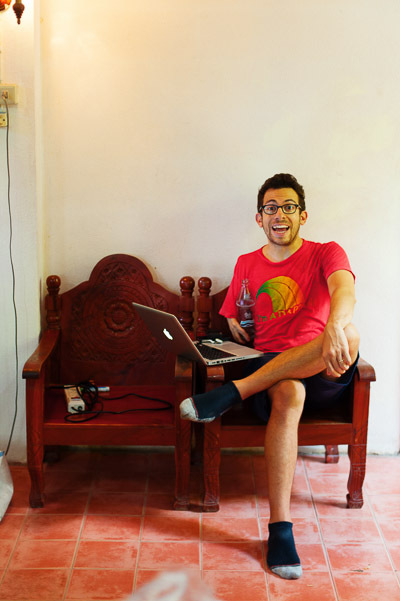 JJ Goode co-wrote Pok Pok with Andy Ricker. Bon Appétit's recent nominee for a food-based Nobel Prize, JJ has worked on, both openly and clandestinely, several high-profile cookbooks. But I suspect that the Pok Pok book was, in many ways, not his usual assignment. where he sat for hours each day, furiously taking notes and asking questions. When Andy cooked something, JJ was also furiously taking photos, videotaping, asking more questions and prodding Andy to weigh even the most minute ingredient and to explain his reasoning behind every single step. By the end of the month, I suspect that Andy's desire to kill me was only overshadowed by his desire to kill JJ. But his insistence paid off, and the result of their collaboration is a cookbook that is not only clear and patient, but one that's eminently readable, with a distinct voice and an engaging narrative. With the book due to be released at the end of this month (it's currently available for pre-order here or here), I asked JJ a few questions about the process of putting it together. -You've worked on quite a few cookbooks spanning quite a few concepts and cuisines. What makes this book different? The biggest difference was in writing the recipes. Most of the books I work on are with chefs who create food, who come with dishes or interesting takes on classic dishes. Andy, however, does not create dishes. He tries to replicate dishes that he's had in Thailand. Not only that, the food is totally unfamiliar to most of us. It was really fun to try to figure out a way to introduce the food to readers that wasn't too filled with facts and dates. So instead of acting as an all-knowing authority or expert (a role in which, to his credit, he's not entirely comfortable), he acts as a sort of tour guide, one who understands where you're coming from, because he was once just like us: new to the country and to the food. 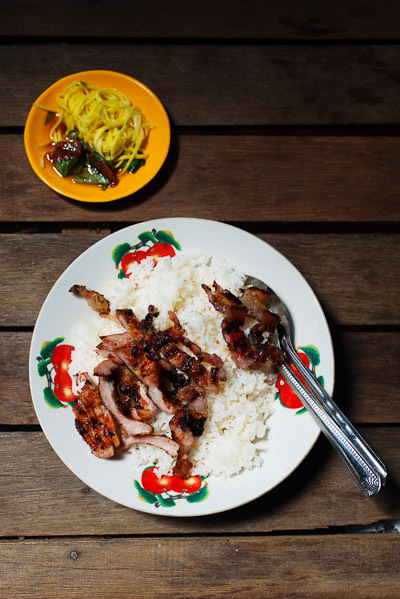 -Some of the dishes profiled in Pok Pok are relatively unknown, even here in Thailand. What were the challenges in writing a book about such an obscure cuisine? The recipes were the big challenge, for sure. Again, he's not creating food. He's replicating it. He works really hard to do it with ingredients available in the U.S. and he wants to do it faithfully, so shortcuts or substitutions that change the proper flavor profile are a no go. The recipes have to provide a lot of extra details, because so many of the techniques and ingredients are unfamiliar. Most cookbooks tell you to "peel carrots" or "blend until smooth"; all of us can do that, no problem. In this book, however, we had to consider that people might not just know how to, say, get at the tender heart of lemongrass or to properly pound green papaya in a mortar for som tam (aka much more gently than I initially assumed). Not only that, but once you get the recipes right, you also have to convince the reader of two seemingly contradictory things: that recreating real-deal Thai food is totally possible and doable at home, but that getting it right takes some real effort. -Based on your experiences cooking Thai food at home in New York City, can someone in the US really expect to be able to make all of the dishes in the book? One hundred percent yes. Some dishes take more work than others. But every ingredient he calls for is available here, and we offer advice on how to find it. For the rare ingredients, like makhwen [prickly ash; a type of dried spice], he provides substitutions that don't sacrifice flavor. I've done a lot of shopping while working on this book. And I'm always shocked at how much is available, at Chinese and Southeast Asian markets mostly but also at farmers markets and even major supermarkets. For instance, Whole Foods (at least the one on Houston Street in Manhattan) sells not just lemongrass but fresh Thai chiles and fresh turmeric root! 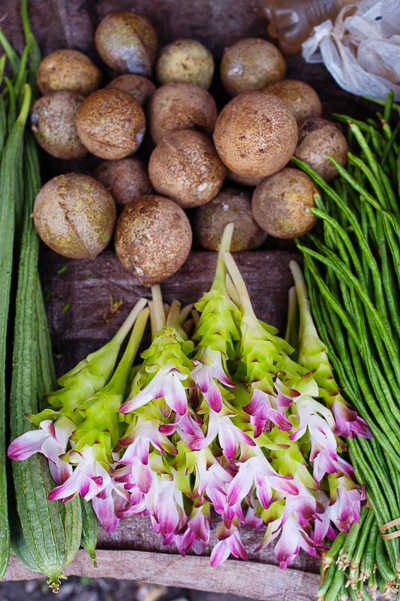 Then there are awesome online sources like Temple of Thai, which will ship you ingredients, even fresh stuff like green papaya, chiles, galangal, and hot basil. And once you build up a pantry, the shopping trips become less frequent and the cooking gets easier and easier. Right now, my pantry has palm sugar and tamarind pulp and black and thin soy sauces and other stuff that will last forever. In my freezer, there's frozen galangal, kaffir lime leaf, pandan leaf, fresh chiles, and cilantro roots. I barely have to leave the house to make some of the dishes in the book. 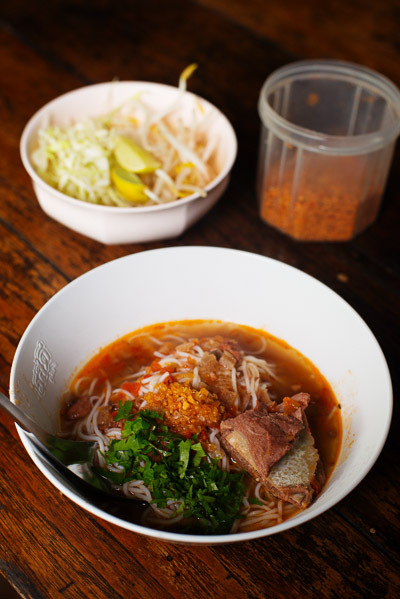 -You chose khao soi as the recipe to feature here. Why? Any tips on making the dish? It’s a dish I've made at home many times, even after the book was finished. It shocks me every time I cook it: I'm like, I can't believe I made this! The key for the home cook is breaking the dish up into steps. You can pound the paste a few days before you want to serve it (or you can freeze it for months!). You can fry the noodles the day or two before. You can even make the curry a day or two before. So when your friends come over, all you really have to do is warm it up, boil the noodles, and accept the inevitable high-fives. 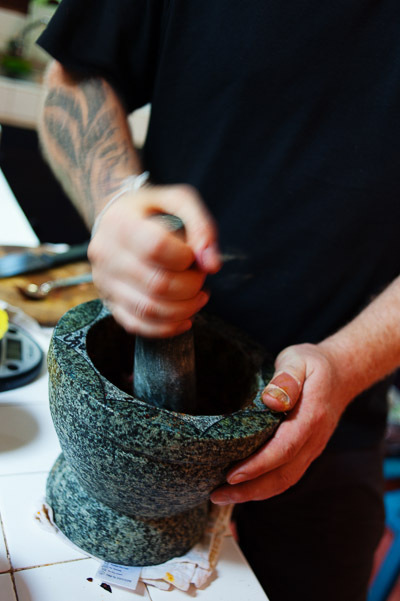 Make the curry paste Use a pestle or heavy pan to lightly whack the cardamom pod to break the shell. Pry it open, take out the seeds, and discard the shell. Combine the cardamom seeds in a small pan with the coriander and cumin, set the pan over low heat, and cook, stirring and tossing often, until the spices are very fragrant and the coriander seeds turn a shade or two darker, about 8 minutes. 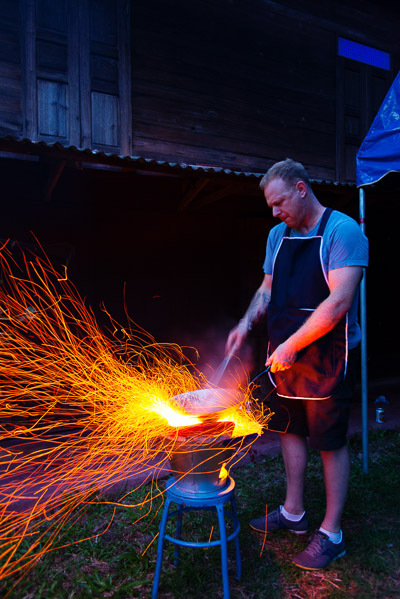 Let the spices cool slightly and pound them in a granite mortar (or grind them in a spice grinder) to a coarse powder. Scoop the powder into a bowl and set aside. Combine the dried chiles in the mortar with the salt and pound firmly, scraping the mortar and stirring the mixture after about 3 minutes, until you have a fairly fine powder, about 5 minutes. Add the lemongrass and pound until you have a fairly smooth, slightly fibrous paste, about 2 minutes. Do the same with the galangal, then the ginger, then the garlic, and then half of the shallots, fully pounding each ingredient before moving on to the next. Pound in the dried spice mixture, then the rest of the shallots. Finally, pound in the shrimp paste until it’s fully incorporated, about 1 minute. You’ll have about 10 tablespoons of paste. You can use it right away, or store in an airtight container in the fridge for up to 1 week or in the freezer for up to 6 months. You’ll need 5 tablespoons of paste for 6 bowls of khao soi. Make the curry Heat the oil over medium-low heat in a large, heavy- bottomed pot until it shimmers, add 5 tablespoons of the curry paste and the turmeric powder and curry powder, and cook, breaking up the paste, then stirring frequently, until the paste smells very fragrant and loses the smell of raw garlic and shallots, about 8 minutes. Knowing when it’s done takes experience, but as long as you’re cooking at a low sizzle, the curry will taste great. Some of the paste might brown and stick to the pot, so occasionally scrape it to make sure it doesn’t burn. Add the fish sauce, soy sauce, palm sugar, and salt to the pot, increase the heat to medium-low, and cook, stirring often and breaking up the sugar once it softens, until the sugar has more or less fully melted, about 2 minutes. Add the chicken, tossing to coat the meat in the liquid. Cook for about 2 minutes so the chicken can absorb the flavors a bit, then stir in the coconut milk. Increase the heat to medium high. Bring the liquid to a simmer (don’t let it boil), then decrease the heat to maintain a gentle simmer. Cook, uncovered, stirring occasionally, until the meat comes easily from the bone but isn’t falling off, about 45 minutes. You’ll see droplets or even a layer of red oil on the surface. This is good. The broth will taste fairly salty and intense. Keep in mind that it will dilute slightly after you add the coconut cream later. You can keep the curry warm on the stove for up to 3 hours or in the fridge for up to 3 days. (It’ll get even better as the flavors meld and the meat soaks up some of the curry.) Bring it to a very gentle simmer right before serving to make sure the chicken is heated through. Finish the dish Pour enough oil into a wide medium pot to reach a depth of 2 inches and set the pot over medium-high heat. Heat the oil to 350°F (or test the temperature by dropping a piece of noodle into the oil; it should turn golden brown in about 20 seconds). Put 3 ounces of the noodles on a plate and gently toss them so there are no clumps. Fry them in 6 portions, turning over the nest of noodles once, just until the noodles are golden brown and crunchy, 20 to 45 seconds per batch. 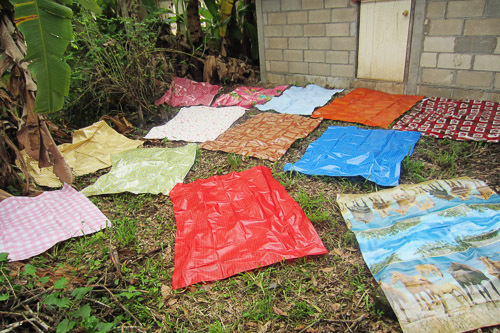 Transfer them to paper towels to drain. You can let them cool and store them for a day or two in an airtight container kept in a dry, cool place (not in the fridge). When you’re nearly ready to serve the curry, bring a large pot of water to a rolling boil. Add the remaining noodles and cook, stirring occasionally, just until the noodles are fully tender (you’re not going for al dente here, but not mushy either), 2 to 3 minutes. Drain them well and divide them equally among 6 bowls. To each bowl, add a thigh and drumstick, ladle on about 1 cup of the curry, spoon on 1/4 cup of the warm coconut cream, and top with a nest of fried noodles. Serve the bowls with a plate of pickled mustard greens, shallots, lime wedges, and cilantro; a bowl of the chile paste; and a bottle of fish sauce. Season your bowl and stir well before you dig in. 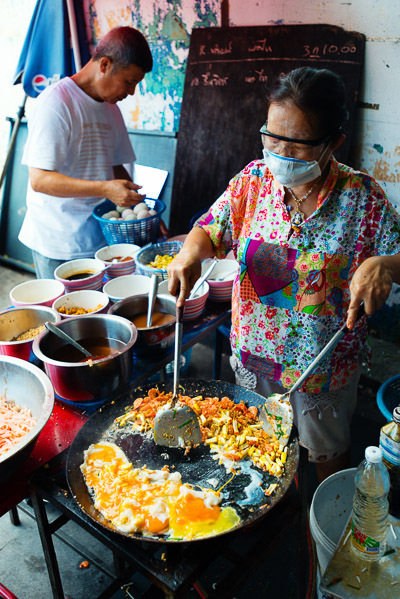 Pok Pok: Food and Stories from the Streets, Homes, and Roadside Restaurants of Thailand is scheduled to be released at the end of this month (you can pre-order the book now here or here). 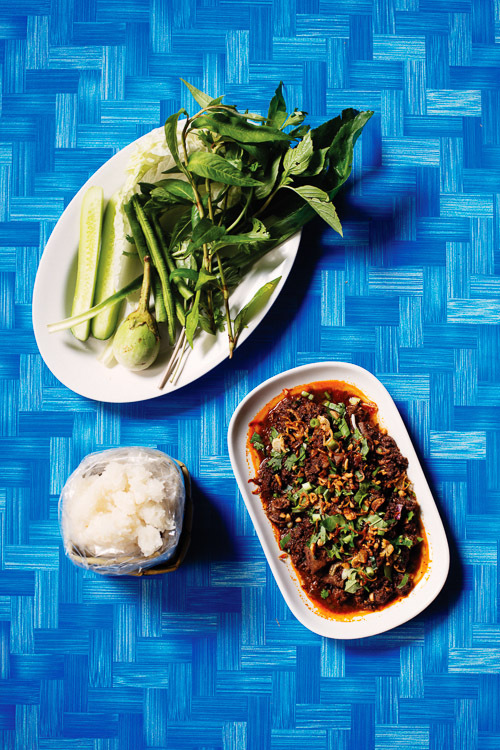 The book profiles the mostly regional Thai dishes served at the Portland, Oregon and New York City restaurants of chef/restaurateur, Andy Ricker. Andy and JJ Goode collaborated on the writing, and I did the photos. That's a distinctly unceremonious introduction for something that's pretty big deal for all of us involved. But how to begin? It's nearly impossible for me to look at the book objectively. For one, it's a thick book that covers a lot of ground -- 70 recipes, to be exact -- and one that comes as the the result of many, many months of work. 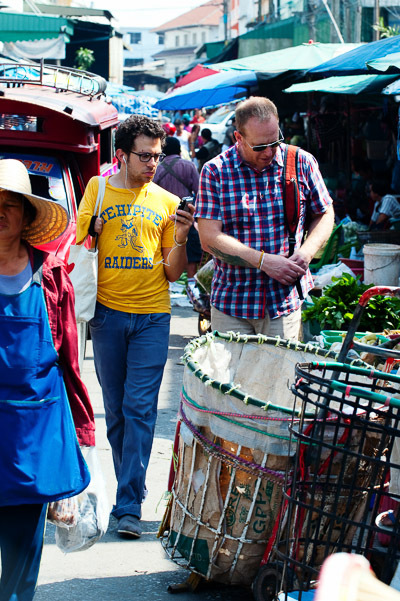 Yet it doesn't seem that long ago that I was up in Chiang Mai with Andy and JJ, shooting the pics. It was a pretty tough gig -- there was a lot of stuff to be photographed in a relatively short period of time -- and there were times when I felt like I was in over my head. But I learned a lot. And It was also a lot of fun. proposing two or three alternatives. Some combos clicked immediately, I shot them, and the resulting pics look, if I don't say so myself, awesome. Others seemed to go together at the time, yet looking at them now, I'm not convinced that they work. But ultimately I'm happy with the fact that every image in the book looks real. There was no food stylist hovering over each dish with a pair of tweezers and a bottle of glue; Andy cooked each dish just as if it were meant to be eaten, ran it out to my 'studio' (a wall-free plot of concrete covered by a tin roof), perhaps sprinkled a garnish over it, and I shot it. That was the process for every single image. And as a result, the dishes in the book look exactly like they came from a home, stall or restaurant in Thailand because, well, they did. And that's something I'm proud of. I'll be profiling three recipes from the book, coupling them with interviews with the guys involved. For my pick, I thought I'd go with kuaytiaw khua kai, wide rice noodles fried with chicken and egg. I chose this not only because the introduction to the recipe describes the time when I took Andy to this stall in Bangkok's Chinatown, but also because it's one of my favourite Bangkok-style Thai dishes, not to mention one that doesn't require any particularly obscure ingredients (in Thailand, the dish is made with a type of preserved squid, here Andy suggests fresh squid or cuttlefish as a substitute). Prepare the noodles Carefully separate the noodles. Unless you’ve found freshly made noodles, either microwave them briefly or briefly dunk them in boiling water (for a few seconds) just until they’re pliable enough to separate without crumbling. Drain them well before proceeding. Stir-fry and serve the dish Combine the egg, oyster sauce, fish sauce, sugar, and pepper in a small bowl and beat together well. Line a large shallow serving bowl with the lettuce. Heat a wok over very high heat, add the fat, and swirl it in the wok to coat the sides. When it begins to lightly smoke, add the chicken and stir-fry (constantly stirring, scooping, and flipping the ingredients) until the slices are barely cooked through, about 1 minute. Add the cuttlefish, stir-fry briefly, then push the chicken and cuttlefish to one side of the wok. Add the noodles to the center, prodding and stirring them lightly so they don’t clump together. Decrease the heat to medium-high, scoop the chicken and cuttlefish on top of the noodles, and cook them, undisturbed, for 20 seconds or so. Ideally, the noodles will bubble and blister at the edges. Stir the egg mixture once more, pour it directly onto the noodles, then sprinkle on 1/4 cup of the green onions. Use the wok spatula to flip over the noodle-egg bundle onto the chicken and cuttlefish and cook undisturbed for about 1 minute. Use the wok spatula to break up the bundle and stir- fry until the cuttlefish is completely cooked, about 1 minute more. Transfer the noodles to the lettuce leaves, and sprinkle on the extra green onions. 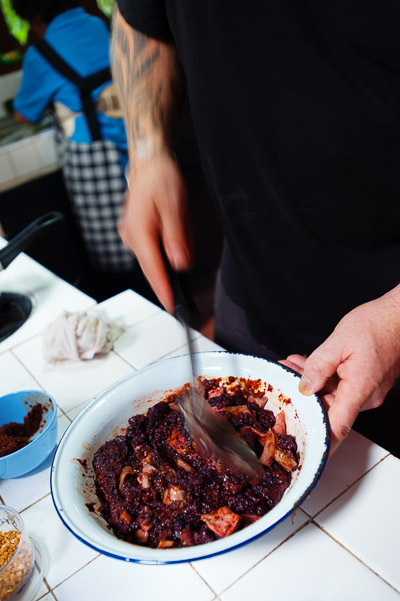 Season to taste with the fish sauce, sugar, vinegar-soaked chiles, and chile powder. On my last couple trips to Myanmar, I've been fortunate enough to visit some destinations that were new to me, and some that are more or less new to tourism. Kayah State happened to be both of these. 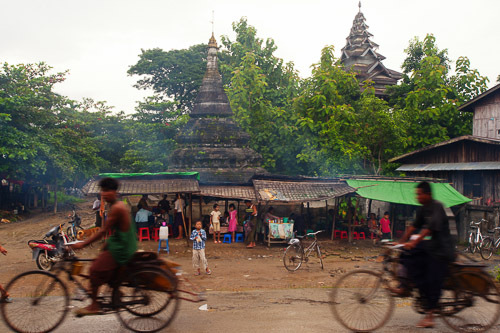 Myanmar's smallest state, Kayah State hugs the Thai border in the country's east. For decades, much of the state was a battleground between the Burmese army and the military wing of the Karenni National Progressive Party. Foreigners have been visiting the area for a while, but only on government-sanctioned group tours, and only then when things were quiet. Today, with a ceasefire signed and fighting relegated to the past, parts of Kayah State have been officially designated 'open' by Myanmar's central government, and for the first time, independent tourists are allowed to visit. 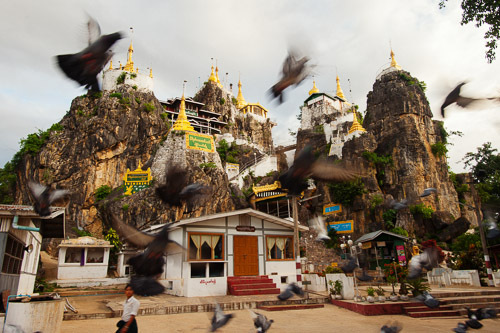 I'd never been to Kayah State, and was excited about the prospect of visiting an 'untouched' destination, and perhaps even encountering some food that was new to me. 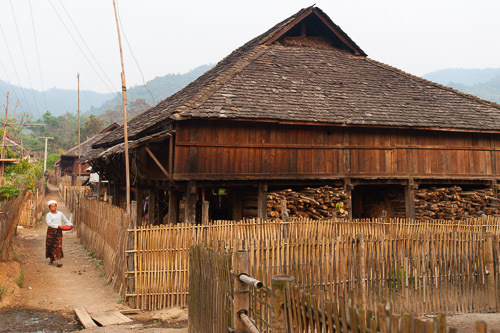 Undoubtedly Kayah State's biggest tourist draw is the Kayan. Known in English as 'longnecks' and in Burmese as Padaung (actually a Shan term meaning 'wearing gold' -- a moniker generally considered pejorative by the Kayan), the tribe is best known for the women's habit of wearing stacks of brass rings around their necks. Over time, the rings lower the women's collarbones and ribcage, making their necks appear unusually long. A common myth claims that if the coils are removed, the women's necks will fall over and the women will suffocate. In fact the women attach and remove the coils at will and there is no evidence that this deformation impairs their health at all. A few local guides are trying to re-establish the tourist trail to Kayan villages, and with them I went to Rangkhu, allegedly the largest Kayan village in the state. We drove about an hour south of Loikaw, the capital of Kayah State, through a savagely deforested landscape of spiky hills. 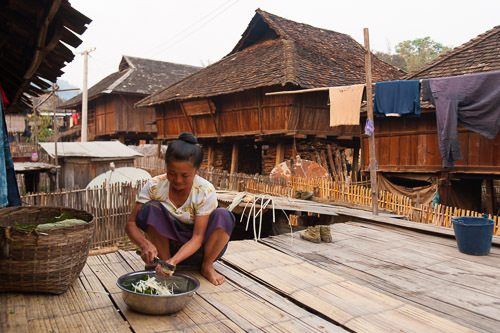 Kayan villages in Thailand have been compared to human zoos, and there are allegations that Kayan women are used to draw tourists at Inle Lake, but there was nothing touristy about Rangkhu. It's a poor, relatively featureless place, whose inhabitants seemed mildly bewildered to see us. Only a handful of tourists have passed through the village in the previous decade, and foreign tourists haven't been allowed to stay overnight in Rangkhu since 1996. It was generous offering for a group of people who didn't appear to have much. unceremoniously deposited the offerings on a rock, and left. 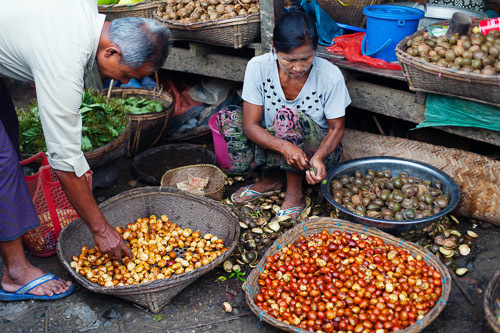 That was about as close as I got to local food in Kayah State. After asking around in Loikaw, I was told that the only local dish available in the town's restaurants was something called hin htoke. It was a simple but delicious dish, particularly when served the Burmese way, with a squeeze of lime and a drizzle of spicy chili oil. Except that it wasn't exactly local; I was told later that hin htoke actually has little to do with Kayah State, and is associated with the Intha, a group of people who live near Inle Lake, in neighbouring Shan State. So perhaps I didn't get to experience local food in Kayah State, but to be honest, if I hadn't been told, I probably wouldn't have noticed. I ate well in Rakhine State. This was a pleasant surprise, as I wasn't quite sure what to expect. 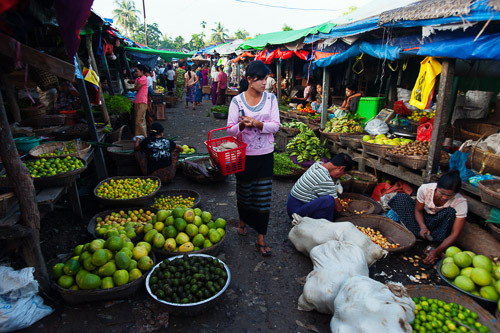 The state's location in Myanmar's far west, along the border with Bangladesh, suggests a South Indian Influence. And a long-standing Muslim population seems to indicate dishes with a halal bias. 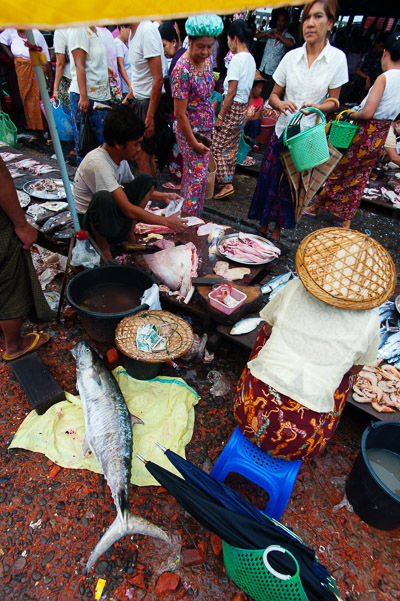 But the food in Rakhine State proved to be distinctly, well, Rakhine. In this case the fish is the basis of the broth, which in the better versions of the dish is somewhat thick and positively spicy from the addition of pepper. Flaked fish also garnishes the dish, along with optional toppings of fish cakes, deep-fried lentil fritters, fresh and/or deep-fried shallots and a drizzle of turmeric oil. Condiments include slices of lime and without fail, a bowl of spicy green chilies, roasted and pounded into a rough paste with salt -- a dish much like the northern Thai nam phrik num. 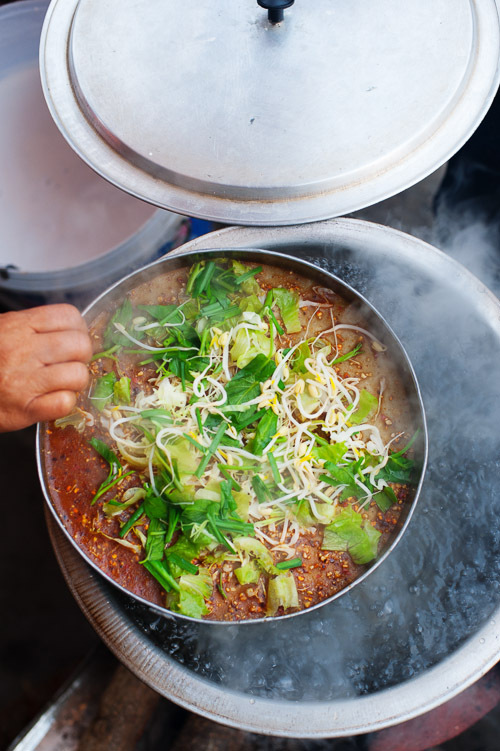 Rice is the main ingredient in the noodles, which are made via a laborious, multi-day process that appears to be the same as that which goes into making Thai khanom jeen. I got to witness the process first-hand at Mahin Kyi village, at the edge of the historical city of Mrauk U.
I found many of the dishes in Rakhine state quite spicy -- a noteworthy contrast with the predominately savoury, mild dishes of central Myanmar. The tart dishes were distinctly tart, and salty dishes were salty -- a full-flavoured approach to cooking that, in many ways, has a lot in common with Thai- and Lao-style cooking. 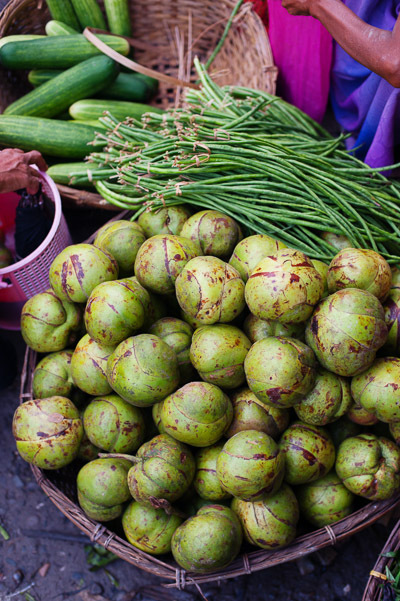 a softball-sized fruit that the locals boiled until it disintegrated into a thick, sour soup, often supplemented with tiny fresh shrimp. hard pods known in English as dogfruit and locally as anyaw thi. The pungent fruit is boiled until tender and served dipped in oil seasoned with a bit of salt, as part of a curry meal. Fish curries were a staple in every curry restaurant I visited in Rakhine State, and in Sittwe I had a particularly tasty one featuring huge squares of fatty, gelatinous stingray. But perhaps the best meal I had in Rakhine State was the one prepared by my guide's wife. I don't have any photos of the meal, but it spanned a rich, oily chicken curry; an intensely smokey/spicy 'salad' of grilled and pounded eggplant; a broth made tart with young tamarind leaves; a vegetable stir-fry; and of course, that spicy chili paste. If you're visiting Rakhine State and require a guide who happens to have a wife who is a talented cook, consider Sittwe-based Naing Naing (+959421746111, mr.theinnaing.f4@gmail.com). To be honest, I found the tea at Pan Yo Ma, 'Flower Mountain' (thanks, Meemalee), a teashop in central Mawlamyine, in Myanmar's Mon State, a bit sweet for my taste. Although it must be noted that not every teashop takes this much care. Nor, thankfully, does every teashop use this much sweetened condensed milk. 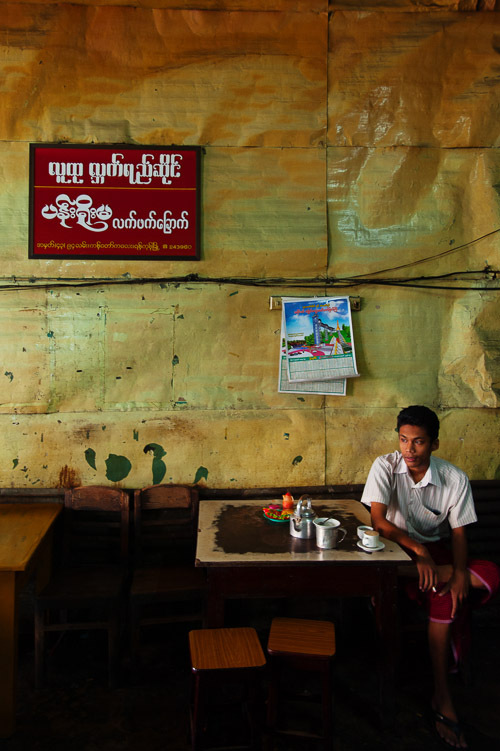 To put it lightly, Myanmar's Muslim community is having a tough time right now. But little of the sectarian violence that has flared up elsewhere appears to have reached the country's largest cities. And on the surface at least, in Yangon and Mandalay, Indian Muslim culture and Burmese Buddhist culture appear to co-exist amicably: new mosques pop up next door to old Buddhist temples, Burmese diners eat biryani at Muslim-owned restaurants, call it a lungee or a longyi but men of every ethnicity are wearing basically the same skirt, and teashops continue to host a diverse clientele. I was particularly struck by this in Mandalay. Walking along 27th street, past Burmese movie theatres, Hindu temples, mosques, Indian-run spice shops and Chinese-owned hotels, I felt like I could have been in India, or perhaps even in Singapore or Malaysia. 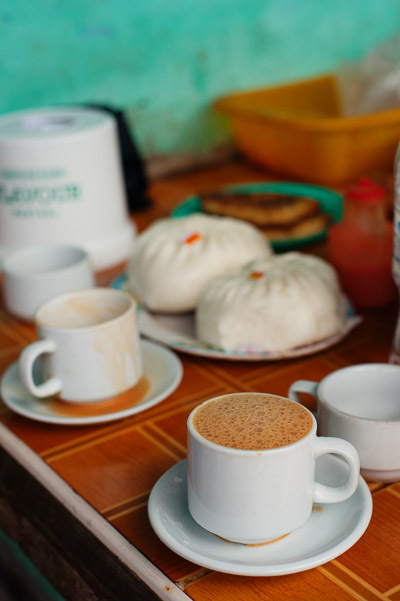 Indeed, this cultural mix was one of the few positive impressions I had of Mandalay; I hadn't been there in almost 10 years, yet it still seemed very much the unpleasant, sprawling, featureless city I'd recalled from previous visits. My only other positive impression -- a direct manifestation of Mandalay's multicultural vibe -- was of the food. 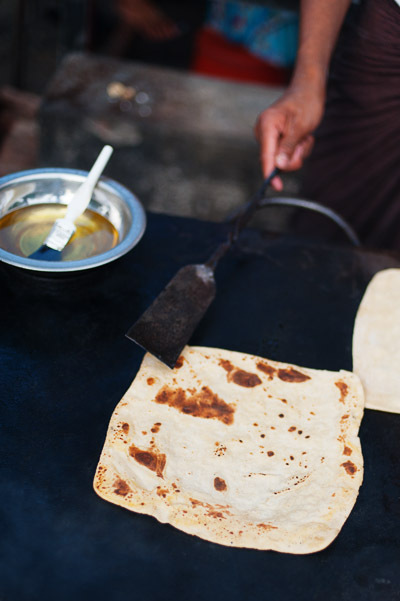 The chapattis were great -- huge, tender and warm -- perfect for dipping in the rich and oily, but not particularly spicy, mutton curry. 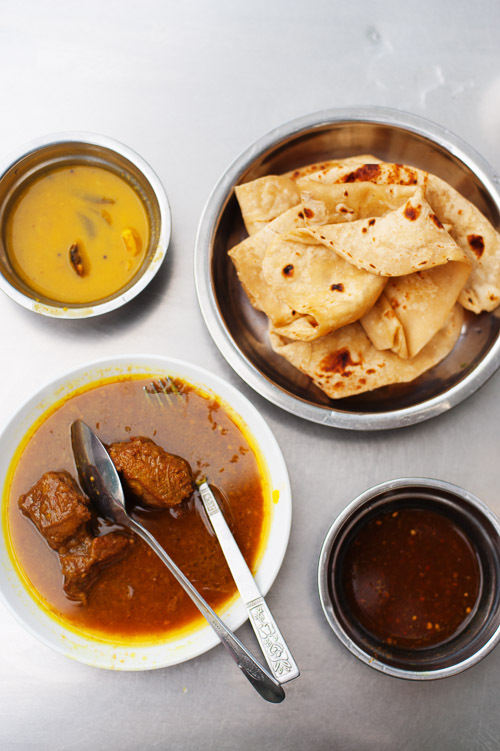 The breads were served, straight off the griddle, as a set, and addition to the curry, there was a deliciously tart, watery tamarind-based dip and a hearty dal (lentil soup) that, unusually, seemed to have been made from beef stock. It was essentially South Asian food, but with, perhaps, a couple Burmese twists. And eating this meal at the side of the street, watching passing Indian sweets vendors and trying to hear my thoughts over the sound of car horns and muezzin, for a moment at least, I almost kinda liked Mandalay. If you're thinking about hitting Nay Cafe, be sure to get there early; dishes, in particular the chapatti, sell out as early as 8pm. I can be rather difficult to find Shan food in Myanmar's Shan State. At least it can do in the bigger cities or in the western part of the state, which seem to be dominated by ethnic Burmese. 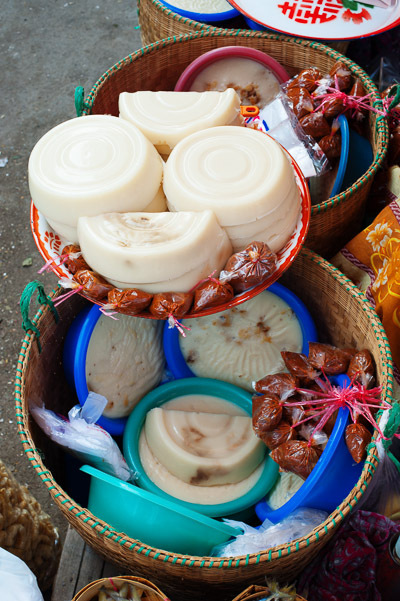 In Taunggyi, the administrative capital of Shan State, I only heard one person speaking Shan, and it was a day or two before I discovered any Shan food, in a stall in the city's night market. 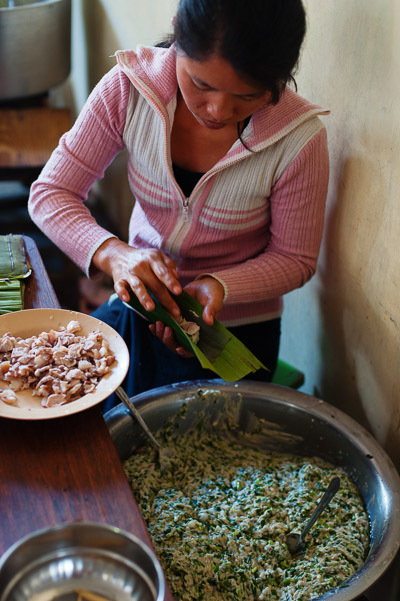 Daw Than Kyi serves what the Burmese call nga htamin, 'fish rice', long-grain rice kneaded with turmeric and topped with flakes of freshwater fish (in Shan/Tai, the dish is known as khao som, 'sour rice'). The warm rice is kept in a cooler and to order is squashed into a thin disk, topped with the fish, drizzled with chili and turmeric oil, and sprinkled with crumbled deep-fried noodles and green onions. 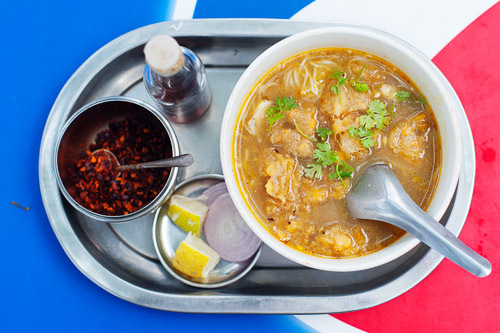 It's distinctly oily and savoury, but supplemented with sides of a small dish of pickled vegetables and a very Burmese side of dhal (lentil soup), as well as optional sides of pork rinds, tiny cloves of raw garlic, chives and peppery leek roots, it becomes a dish that runs the gamut of tastes and textures. The flavours were authentic, and the dish was even tastier than versions I've encountered in Mae Hong Son, Thailand, and in the more traditionally Tai areas of eastern Shan State, and other similar dishes available at the stall include wet tha chin, a meatier version involving rice steamed with chunks of fatty pork and blood in a banana leaf packet, and one with chicken. 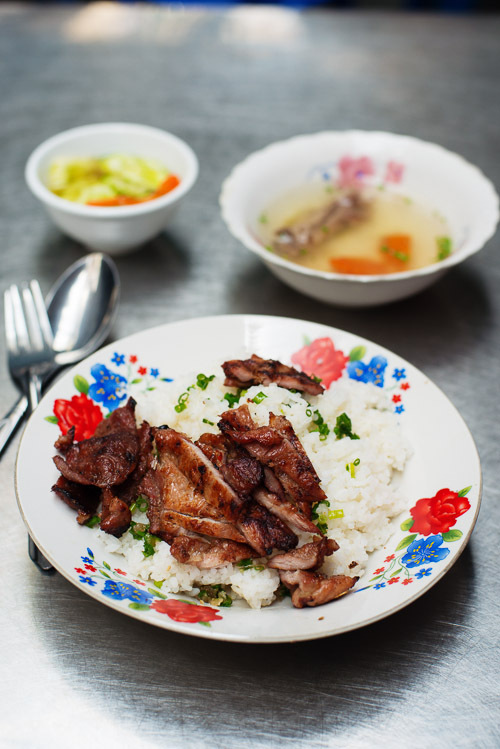 Bai sach chrouk -- rice and pork -- is the name of Cambodia's favourite breakfast dish, as well as a convenient description of what it entails: thin slices of meat served over rice. It's the simplest dishes that are often the most complicated, but I'm going to posit that this is not the case with bai sach chrouk. The dish seems to be sold on just about every corner in Phnom Penh, but I suspect that one would be hard-pressed to find a truly bad version. 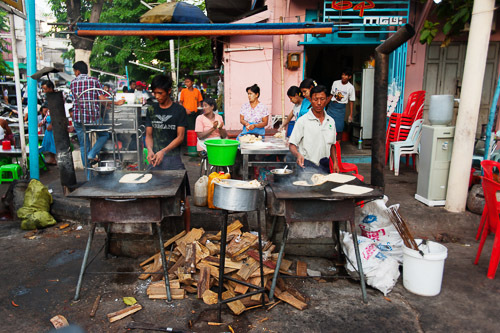 Conversely, I received blank stares when I asked people for the city's most famous bai sach chrouk vendors. I suppose that it's one of those rare dishes that generally operates to a single standard, one that's simple, consistent and delicious. But of course there's more to bai sach chrouk than this. Starting with the meat. 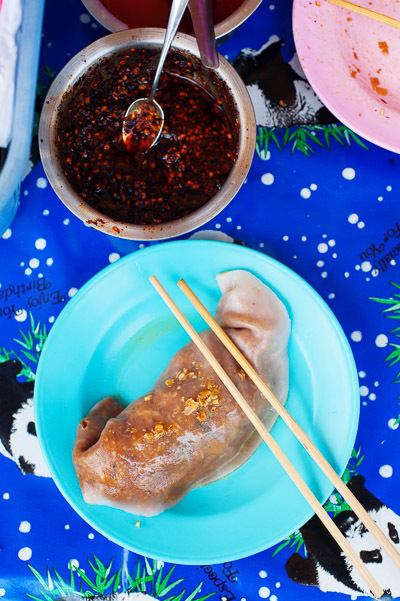 Many vendors marinade the pork, which this being Cambodia, usually means a pleasant mild, balance of salty and sweet -- typically a combination of soy sauce and palm sugar, with perhaps some coconut milk. The important thing is that the the sugar contributes to a nice caramelisation and charring, and in the case of coconut oil (or pork fat) dripping and igniting the flames, a pleasant smokiness. 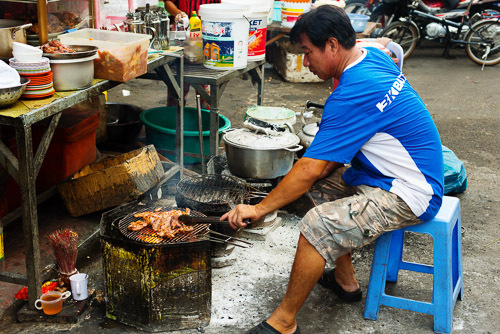 The meat is usually grilled until it's pretty dry, and some vendors compensate for this by topping the dish with couple tablespoons of the marinade, sometimes supplemented with minced pork. Rice, the other essential ingredient, is also unique. Bai sach chrouk is usually served over short, broken grains of rice. Phil Lees suggests that this is probably just a characteristic of the cheap rice used by most vendors rather than any conscious culinary decision. He's probably right, but to my mind at least, this minor detail has become an integral aspect of the dish, much like how a real Maine lobster roll is only served in a split-top bun. The element that takes bai sach chrouk beyond its name is the sides. 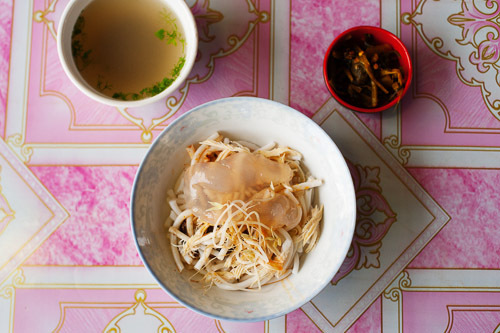 The dish is almost always served with a bowl of broth, typically nicked from the adjacent noodle vendor, and a small dish of pickles. The latter are generally made with cucumber, carrot and daikon, and are slightly sweet, but I've also encountered other versions, including a deliciously tart one made from shredded mango and slices of pungent 'fish mint' (Houttuynia cordata). 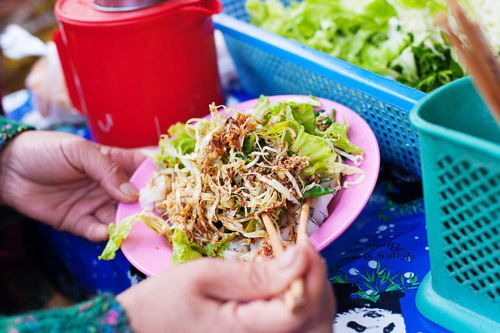 The final and possibly most important thing worth noting about bai sach chrouk is that it's a breakfast dish, which in Cambodia -- a country of early risers -- means that you'll be hard-pressed to find anybody making or eating it after 8am. 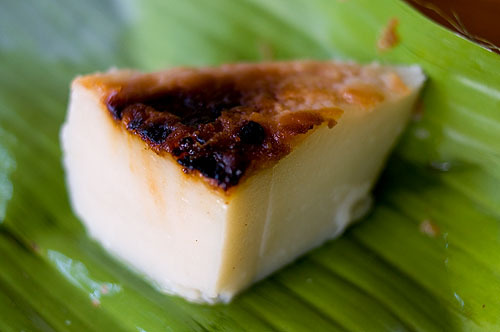 Combine the garlic, soy sauce, sugar or honey, coconut milk and black pepper in a shallow dish and mix well. Marinate the pork in this mixture for 1 hour. Grille the pork over medium heat or roast it in a 400F (200C) oven, turning regularly until it's dried and starts to caramelise, about 15 to 20 minutes. Cut into strips and serve with rice and pickled vegetables [see recipe below]. Combine the vinegar, salt and sugar in a small saucepan and bring to a boil. Remove from the heat and set aside. Combine the vegetables, garlic, chilies and coriander leaves in a bowl. Pour the vinegar mixture over the vegetables and marinate in the refrigerator overnight. Store the pickled vegetables in a glass jar with a tight-fitting lid in the refrigerator. 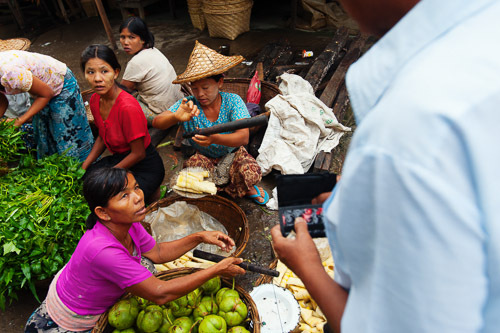 The Burmese love their noodles, and in addition to the Chinese-influenced noodle dishes that are found everywhere in Southeast Asia, in Myanmar, you’ll also discover a uniquely indigenous repertoire of noodles. 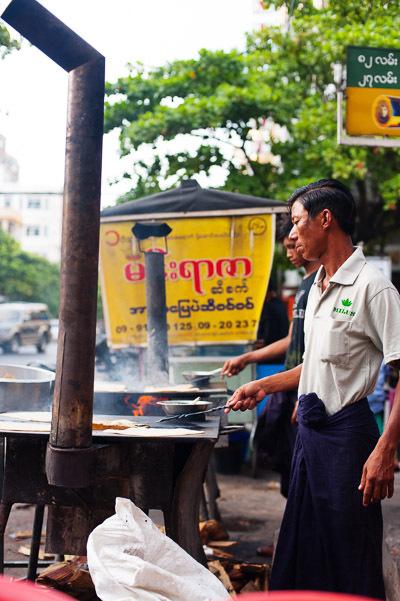 Unlike Thailand's noodle dishes, Myanmar’s have an almost total lack of sugar, and ingredients such as chickpea flour, turmeric oil, deep-fried garlic and toasted sesame provide the dishes with a distinctly savoury profile. 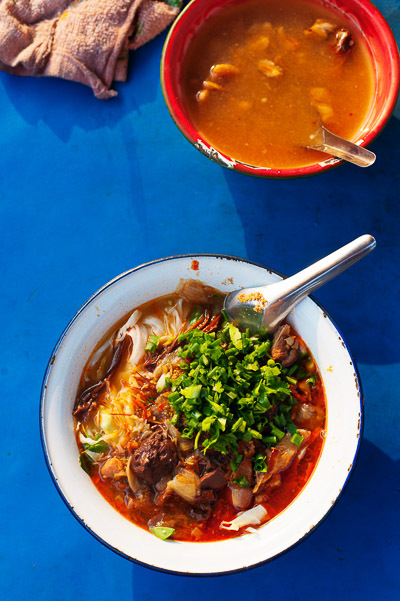 Unlike their counterparts in Vietnam, the emphasis is typically on the noodles and seasonings, not meat or herbs, making Burmese noodle dishes generally quite heavy and hearty. 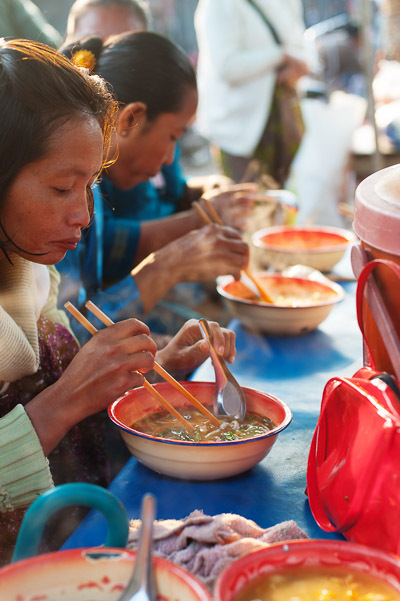 The Burmese also have a particular fondness for ‘dry’ noodles, that is, with broth served on the side. And variety of deep-fried crispy garnishes show an appreciation for texture that one doesn’t generally encounter elsewhere. 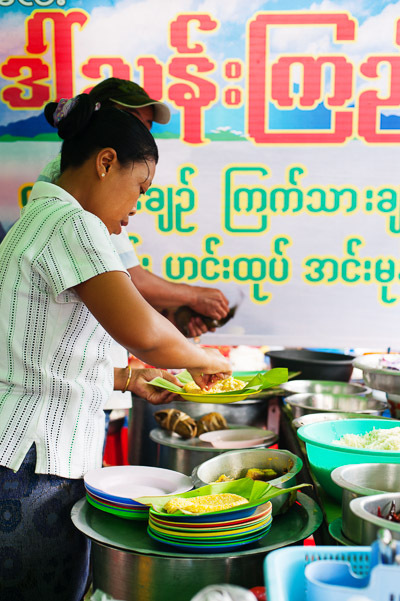 It can be a bit overwhelming, so in an effort to explain the different varieties, here’s a guide to some of the more ubiquitous noodle dishes that you’ll find only in Myanmar. omits the eggs and is served with thinly-sliced shallots. 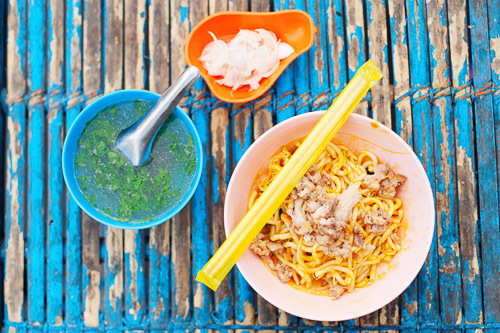 The pair are quite possibly the most savoury of Myanmar’s already savoury noodle dishes, and over the course of my most recent trip to Myanmar, became my favourite. 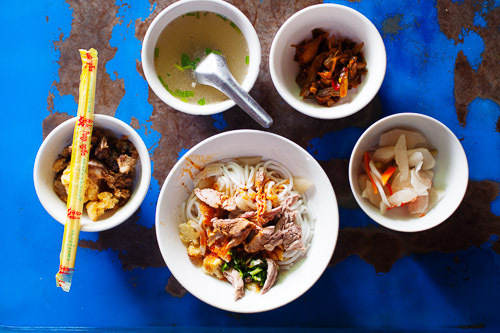 Shan State’s most famous dish takes the form of thin, flat rice noodles in a clear, peppery broth with marinated chicken or pork, garnished with toasted sesame and a drizzle of garlic oil, and served with a side of spicy/sour/sweet pickled vegetables. Compared to most other Burmese noodle dishes, it’s relatively bland and simple, but is still satisfying and delicious. 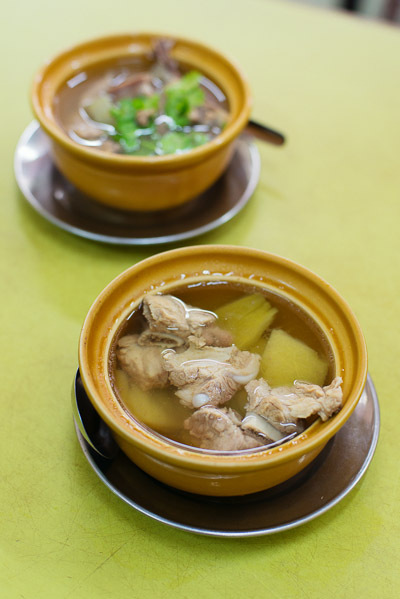 A ‘dry’ version, in which the broth is served on the side, is also common. 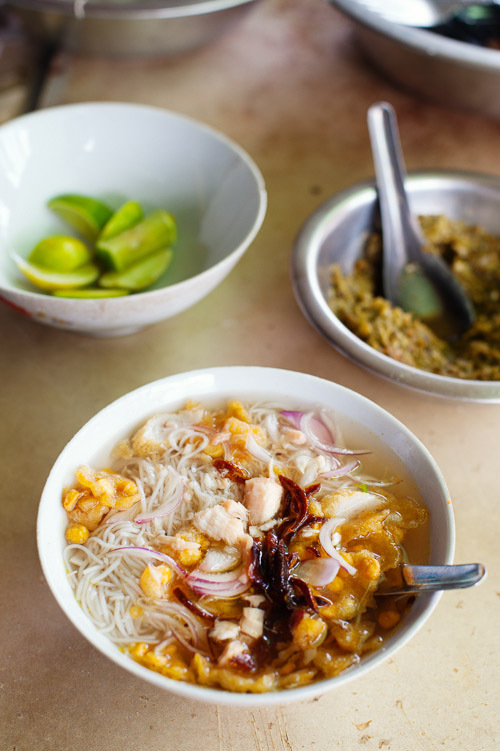 Myanmar's unofficial national dish consists of fine, round rice noodles – similar to the Thai khanom jeen -- served in a thick, somewhat herbal fish- and shallot-based broth, often supplemented with the crunchy pith of the banana tree. Optional toppings include sliced hard-boiled egg or akyaw, deep-fried crispy veggies and/or disks of lentil batter. 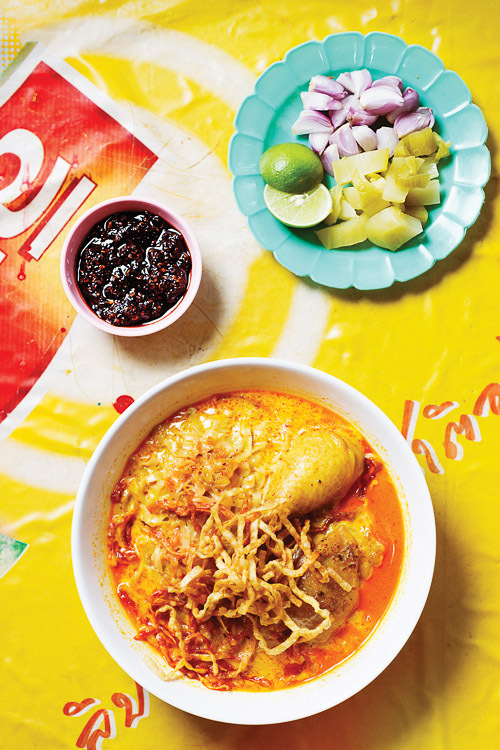 Thought to be the inspiration for the northern Thai khao soi, this Shan dish unites thin, pale wheat noodles, a mild coconut milk-based broth, shredded chicken, slices of hard-boiled egg, a deep-fried crispy garnish and a conservative drizzle of chili oil. 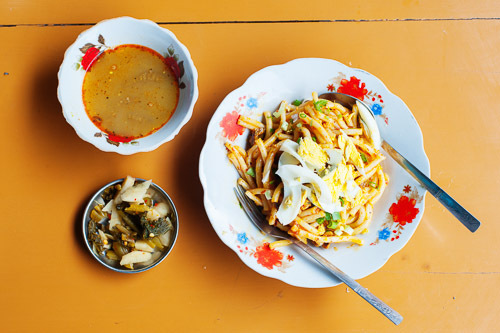 Like khao soi, the dish is often served with sides of sliced shallots and lime, although unlike that dish, and unusually for Burmese noodles, no pickled vegetables. 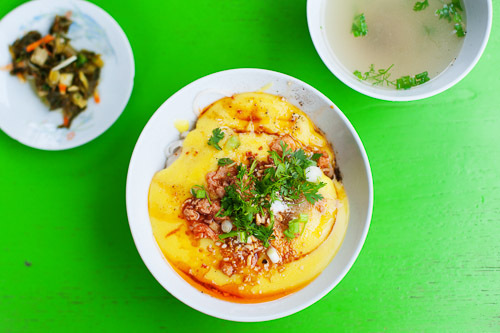 Literally 'warm tofu', this dish is similar to shan hkauk hswe, except that the clear broth is replaced by a thick porridge made from chickpea flour. The mixture is supplemented with chunks of marinated chicken or pork, a drizzle of chili oil, and sides of pickled veggies and broth. It’s not an attractive dish, but if you’re a fan of savoury flavours, you won't mind. is usually served with pork, and comes with sides of deep-fried crispy bits (in this case croutons made from fried bread), pork offal, and two types of pickles. Both versions are seasoned with turmeric and chili oil, and come served with sides of pickled veggies and broth. 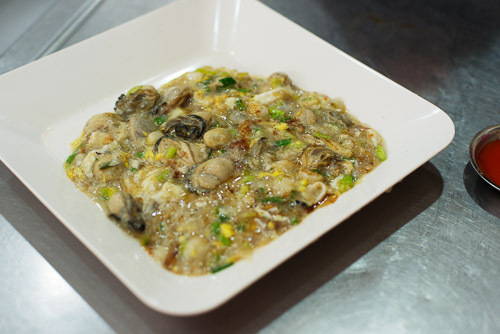 Or suan (อ่อสวน) is made by frying a batter made from paeng man (แป้งมัน), tapioca flour, along with egg and oysters. 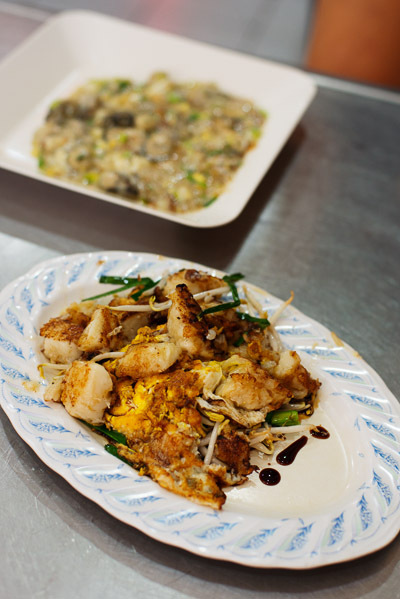 The batter made from this particular type of starch tends to remain soft, sticky and stretchy -- essentially the point of this dish, which takes the form of a sort of gloopy oyster pancake. and to be honest, it didn't have heaps of flavour, but it's indicative of the soft, squishy texture that defines old-school or suan. Not all vendors go that gloopy though, some opting instead for a slightly more set, almost omelet-like version of the dish. Nay So, another Chinatown old-timer, does a good example of this take (pictured at the top of this post). 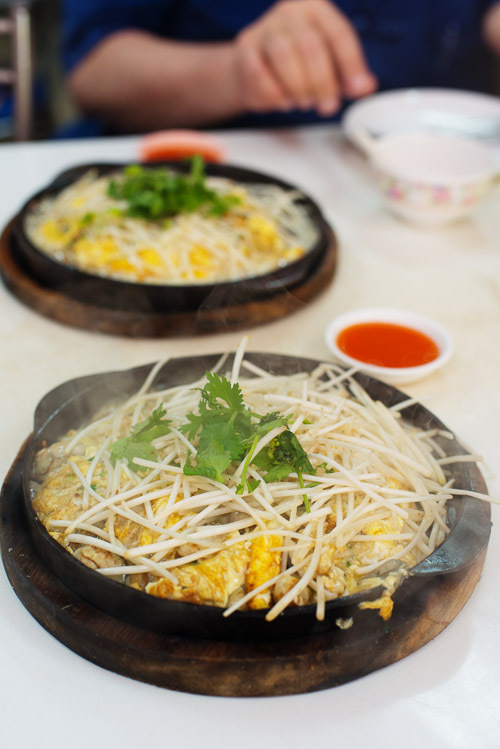 The or suan here is prepared and served on a sizzling hot plate, and unusually, arrives topped with a pile of beheaded bean sprouts. The hotplate continues to cook the dish even after it's been served, and the result has all the flavours of a good or suan, but none of the gloopiness. 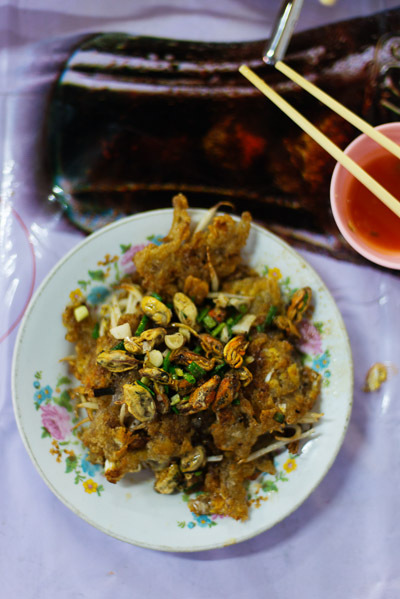 The crispiest -- and most common -- version of the batter/egg/shellfish combo is hoy thot (หอยทอด), mussels and egg fried with a batter, and served on (or sometimes topped with) a bed of flash-fried bean sprouts and green onion. In English, I usually refer to the dish as 'mussel omelet', but have come to like Andy Ricker's 'crispy broken crepe', which although it doesn't exactly roll off the tongue, is probably more indicative of the way the dish is made. Like all the places mentioned here, Yu Huat fries the dish in lard, but not over coals -- at least not any more. "That was during grandpa's time! It's just too much work," I was told upon asking. Blurring the lines even further, many of the same vendors who do the dishes above employ the same ingredients used to make or suan -- oysters, egg and tapioca flour -- in a dish call or lua (ออลั่วะ). In this version, the normally soft batter is fried until shatteringly crispy -- similar to hoy thot -- then topped with barely-cooked oysters. 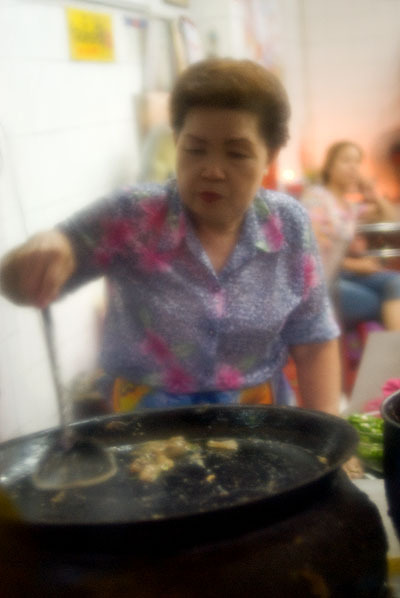 A great version of this dish -- crispy, lardy, smokey (because here they do cook over coals) -- can be got at Nay Mong. 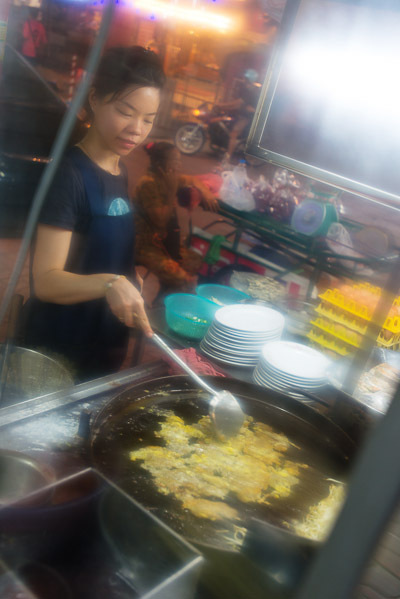 fits the familiar pattern of a batter -- in this case a heavy dough made from rice flour and shredded white radish -- fried with egg, sprouts and green onions. "It's the place with all the cars out front." That's how people in Chiang Rai kept describing Laap Sanaam Keelaa to me. They were right: it's indeed popular and the parking lot was full every time I stopped by. But for whatever reason, nobody mentioned how absolutely delicious the food was. Perhaps this was because for the people of Chiang Rai, Laap Sanaam Keelaa is really nothing special. 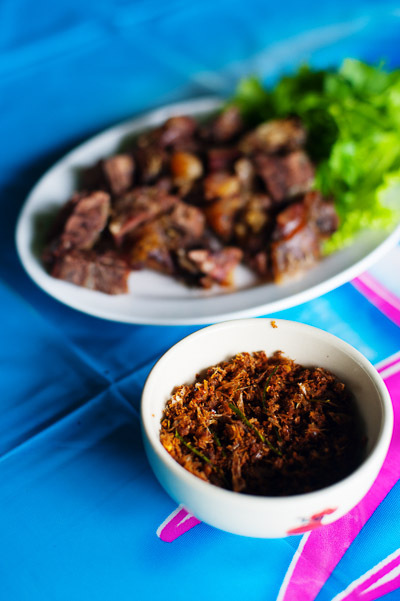 On the surface, it's your typical northern Thai-style laap shack: open-air, tin roof, dirt floor, an almost unanimously meaty menu, and on one visit, a mischievous goat wandering through the restaurant. Unassuming, humble and consistent, I suppose that it's the kind of place that locals have been eating at for so long they gradually round down their impressions of the restaurant to "good" or in this case, "busy". But the food blew me away, and after several visits, I'd gladly cite Laap Sanaam Keelaa as one of my favourite restaurants serving northern-style meat dishes. On my first visit, I ordered laap muu suk (ลาบหมูสุก), northern Thai-style pork laap (pictured at the top of this post). Here, the dish is served with just barely-cooked meat (most diners appeared to opt for the raw version) and relatively little blood and offal, but quite a bit of chili and dried spice heat, not to mention an exceedingly generous garnish of crispy deep fried garlic and shallots. A immensely satisfying, balanced take on the dish. although drier, and with a bit more dried spice punch, ostensibly, by Thai culinary reckoning, to cover up any unpleasant fishy smells. Now I've eaten northern-style laap a lot, and at this point am familiar with quite a few of the herby sides, but this had me stumped. There were at least eight different kinds of herbs here -- some sweet, some bitter/sweet, some bitter/bitter, some spicy/bitter -- only half of which I could identify by name. The dish was deliciously rich and spicy, and mixed in among the unidentifiable organs were some tender, almost corned beef-like, joints of beef. The beef was relatively tender, and the dip was spicy, smokey and garlicky, and unusually, included thin strips of citrusy fragrant Kaffir lime leaf. I should have known better; the salad was mediocre -- limp and far too sweet. Lesson learned: only order meat. And when seeking out restaurants in the future, look for lots of cars. Don't know your sai ua from your khaep muu? Right this wrong by reading my crash course in northern Thai-style dining from the April issue of Travel + Leisure Southeast Asia -- click on the image above for the PDF version [transliteration typos and Bangkok restaurant recommendation not mine]. 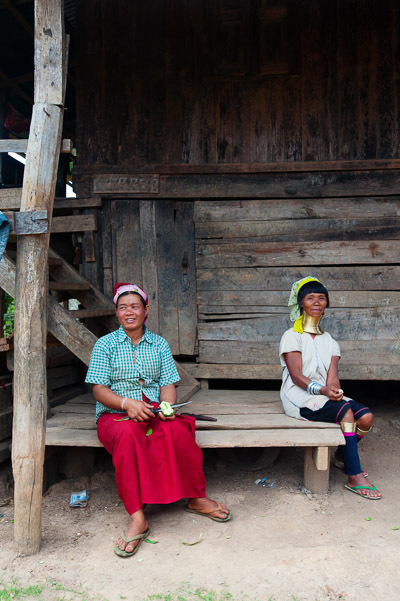 Whenever we visited somebody's home in Shan State, we were inevitably offered green tea or water and a bite to eat. 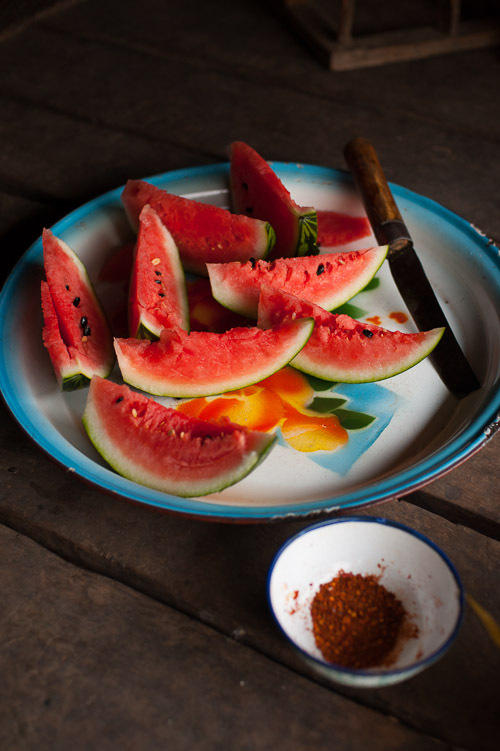 Often the snack was fruit, such as a few bananas or the watermelon shown above. Sometimes it was something a bit more substantial such as nor khom, a type of bamboo, steamed and eaten with a simple but utterly delicious dip made from ground salt, dried chili and makhwaen (prickly ash). I really enjoyed these simple meals, which usually also involved conversation in Tai -- a language I understand very little of, but love to try to figure out -- as well as the chance to peek inside somebody's home. Perhaps one of the more interesting opportunities for the latter was in Wan Puen, a Thai Lue village outside of Mong La. Sitting on this porch, which was about eight feet high, provided me with an entirely different perspective on the village. I was struck by the way the tidy tiled roofs formed something of a rural skyline. That the houses were surrounded by neat fences and faced the same direction also lent the village an almost city-like element of organisation. Shattering this perception was the fact that, directly below every house was a buffalo or cow, and the messiness, sounds and smells that accompany this. Inside, cooking was done on an open hearth; a soot-blackened rack above the fire held garlic, shallots and dried chilli. At the other end of the room, a girl watched a Thai game show on television. After a while, when people had gone back back to doing their chores, and when my guide and our hosts were deep in conversation about the price of dried frogs -- at least that's what I caught -- I had essentially been forgotten about. This casual hospitality left me free to crunch watermelon, take pictures, listen to Tai, and generally just soak up the scene. The places where predominately ethnic Tai people live -- southern China, eastern Myanmar and northern Thailand -- are also some of the earliest known areas of rice cultivation. The Tai may not have been the first people to grow and consume rice, but it's safe to say that they've been doing it for a while now. Yet aside from simply boiling or steaming the grains and eating them with other food, they have also come up with a variety of creative ways of preparing rice. 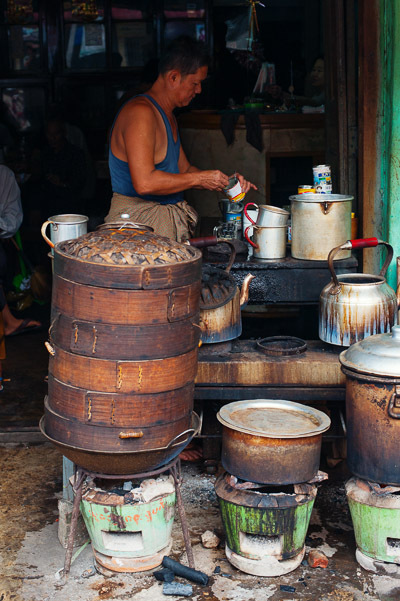 This became clear to me in Kengtung, in Myanmar's Shan State, a place were many of the dishes continue to be very Tai, and largely untouched by the influences of Chinese, Muslim or western cooking styles, providing a unique insight into an ancient diet. 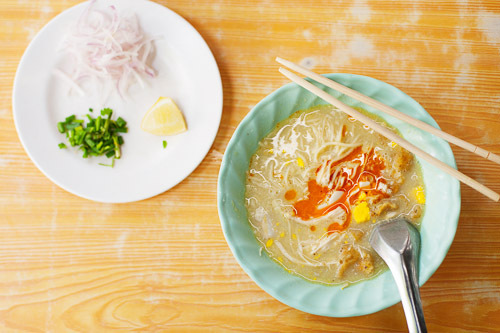 Perhaps the most obvious examples of this is rice noodles, known in Tai/Shan as khao soi. To make these, a batter is made from rice flour and water, which is steamed then sliced into long strands. I'd assumed that the word khao soi had its origins in the Burmese hkauk hswe, which also means noodles and is pronounced very similarly, but my Shan guide insisted that the term is actually Tai in origin. It would require some linguistic research to verify this, but given that khao soi can be translated as cut (soi) rice (khao), not to mention the Tai people's long-standing history of rice cultivation in the area, I wouldn't be surprised if the term could be linked to them. You can even throw an egg in, if you want. Either way, it's spicy savoury, nutty and garlicky, and requires no additional seasoning. resulting in a something of a noodle-based salad. 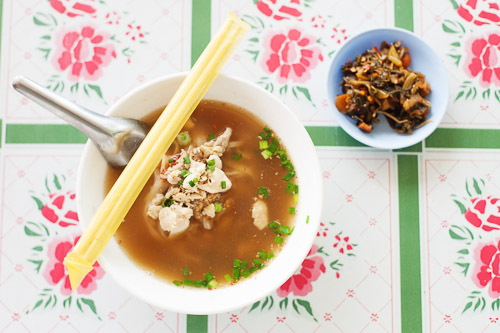 Blurring the line between cooked rice grains and noodles is khao pheun, thick hand-cut noodles made from a type of rice cake. 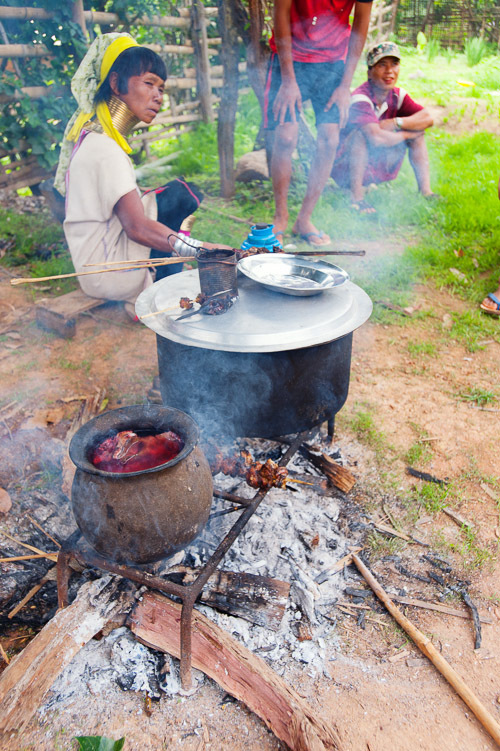 In Mae Hong Son, a similar dish -- there typically made from chickpea flour -- is known as khao raem feun (ข้าวแรมฟืน), 'rice resting by the fire', so called because of the final stage of the cooking process. 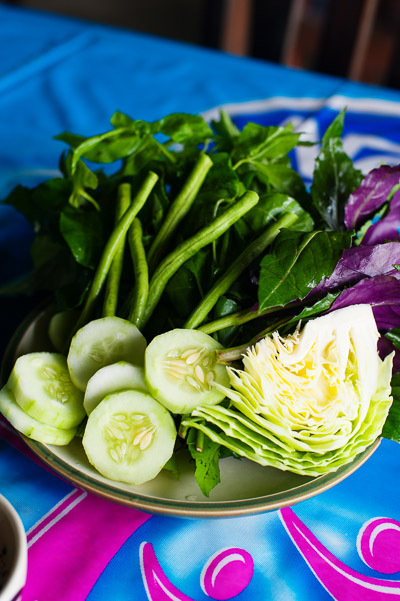 Unless you're invited into someone's home, or buy take-away from the town's morning market, it's actually somewhat difficult to find local food in Kengtung. One of the only restaurants serving Shan/Tai dishes is Paa Laeng (in Thai, ป่าแดง, meaning deep forest), named after the nearby temple. The selection of local eats is pretty good, but it's equally grotty, and is probably only best recommended for adventurous eaters. 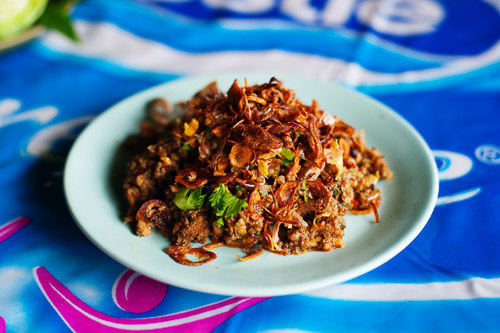 If you're not deterred, in terms of form and flavour, the dishes here have a lot in common with northern Thai food. 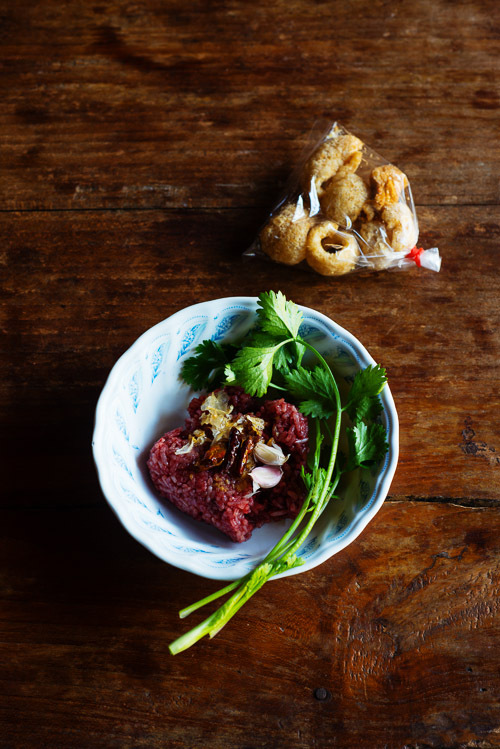 There was a dip nearly identical to nam phrik num, the northern Thai dish of long green chillies, garlic and shallots grilled and mashed into a stringy, spicy paste. This was coupled with neua sa, a dish I later learned to make in Wan Naung Gon. As was the case there, it took the form of minced meat with lots of herbs and makhwaen (prickly ash), resulting in a dish somewhere between northern- and northeastern-style laap. We ordered a simple broth with tofu, tofu skin and the flowers of the Indian cork tree (called dork peep, ดอกปีบ, in Thai). 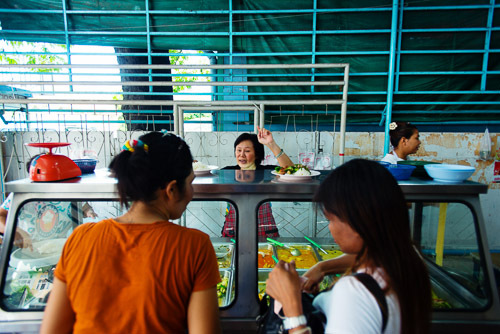 And nearly all customers were ordering hoy khom, tiny freshwater snails, which had been boiled with herbs and were served up from plastic buckets. The backdrop of sucking and slurping made Paa Laeng sound like a Japanese ramen bar.